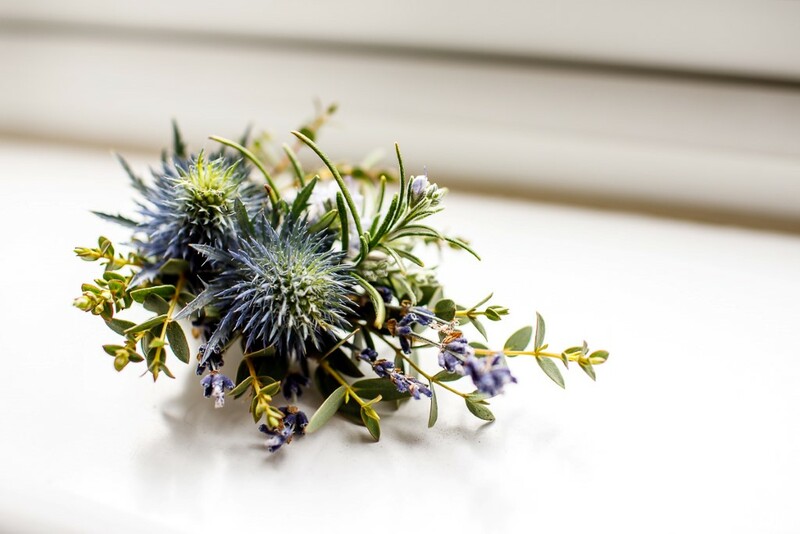 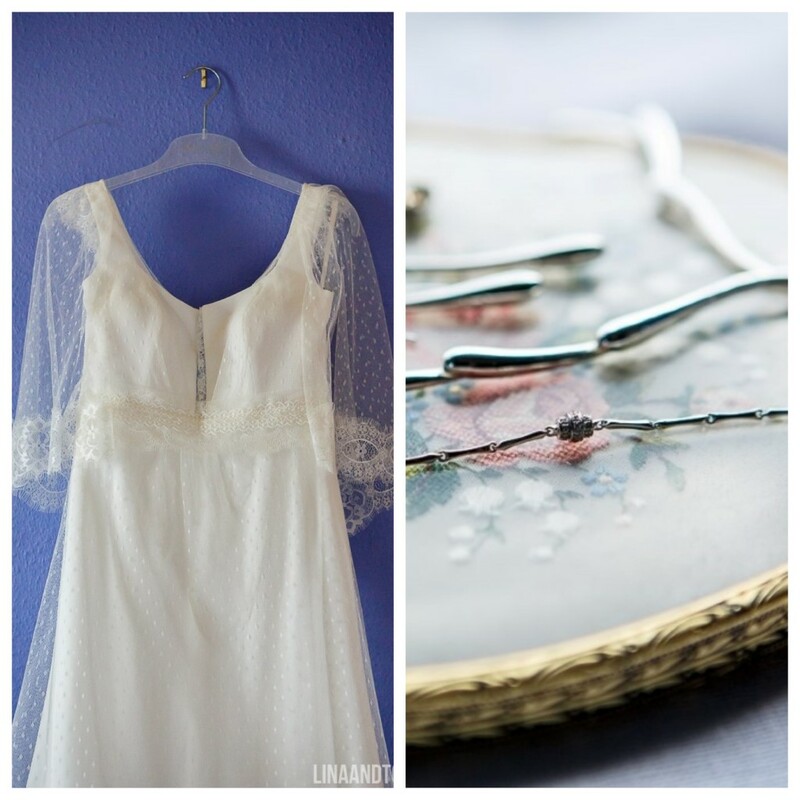 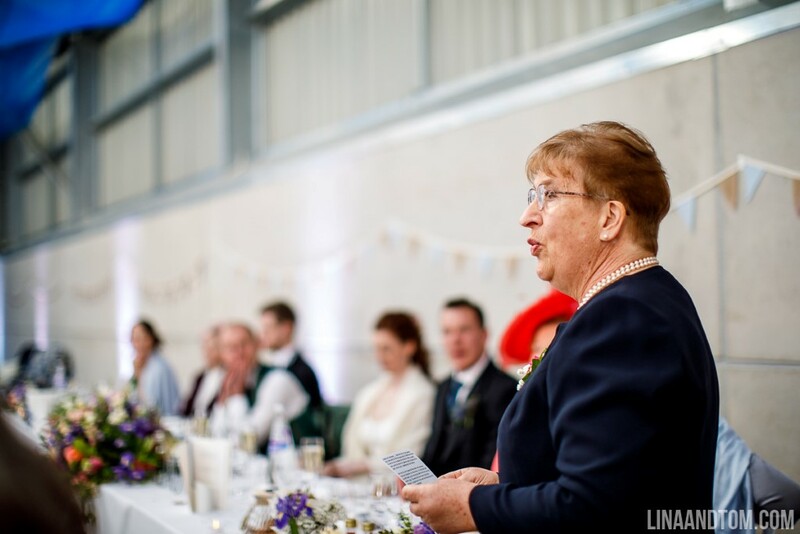 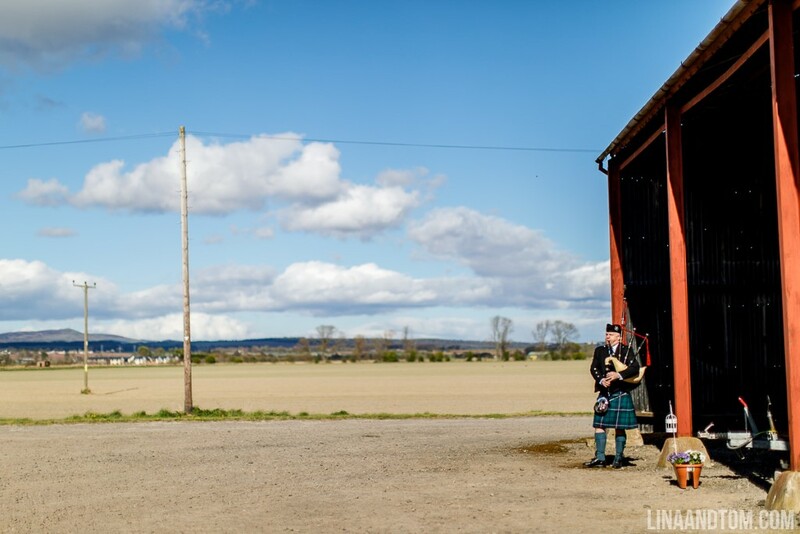 Today I am thrilled to share this gorgeous Scottish Farm Wedding with hints of blue and purple and handcrafted details. 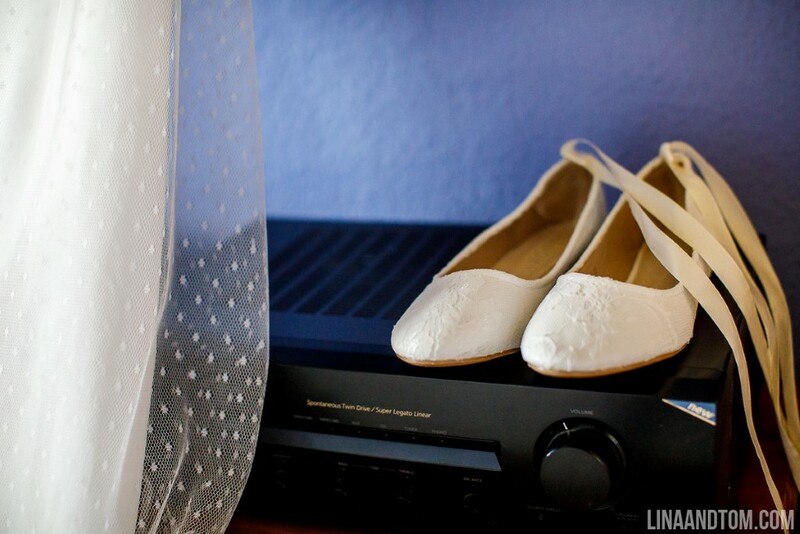 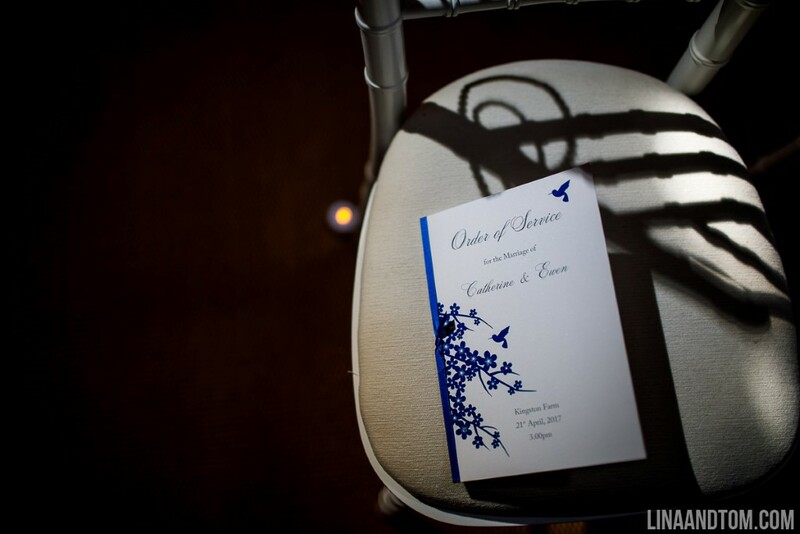 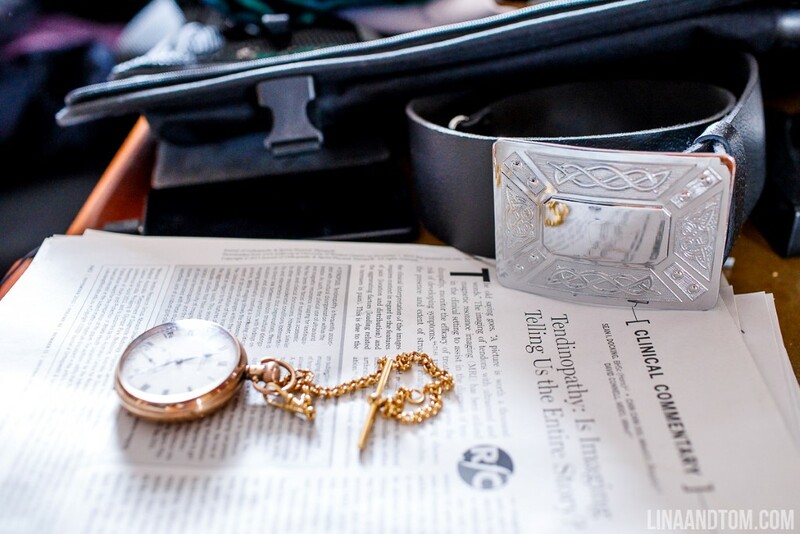 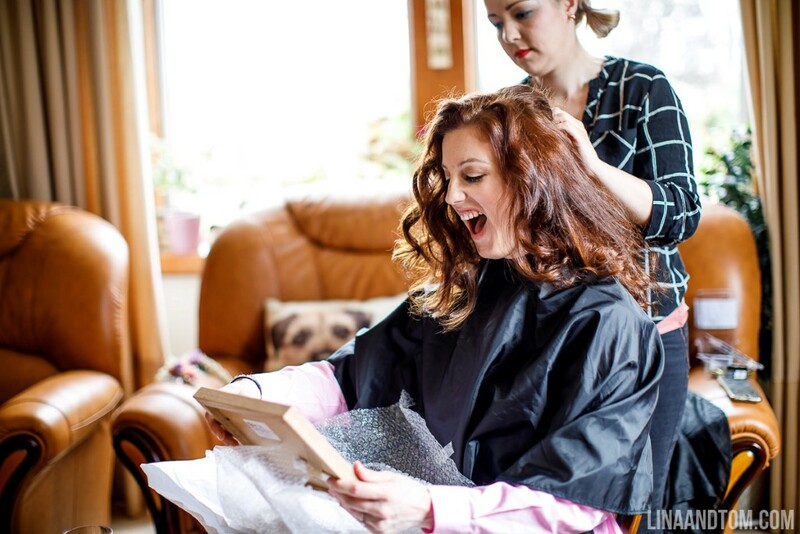 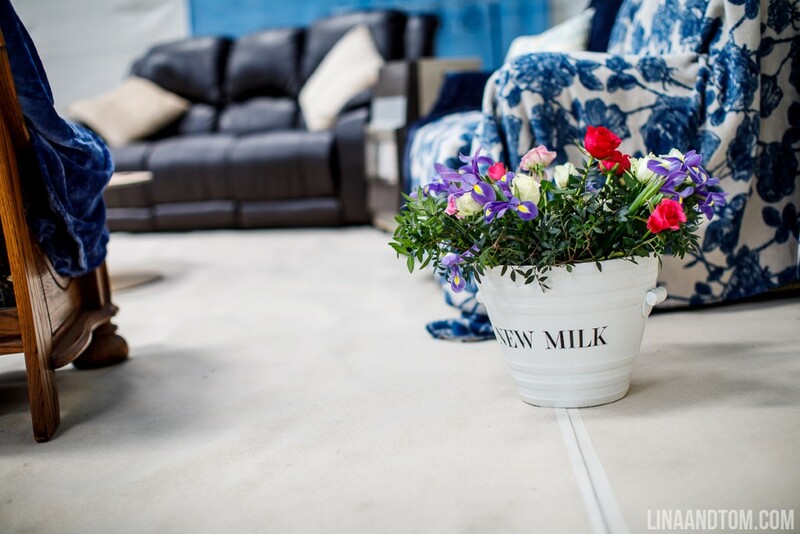 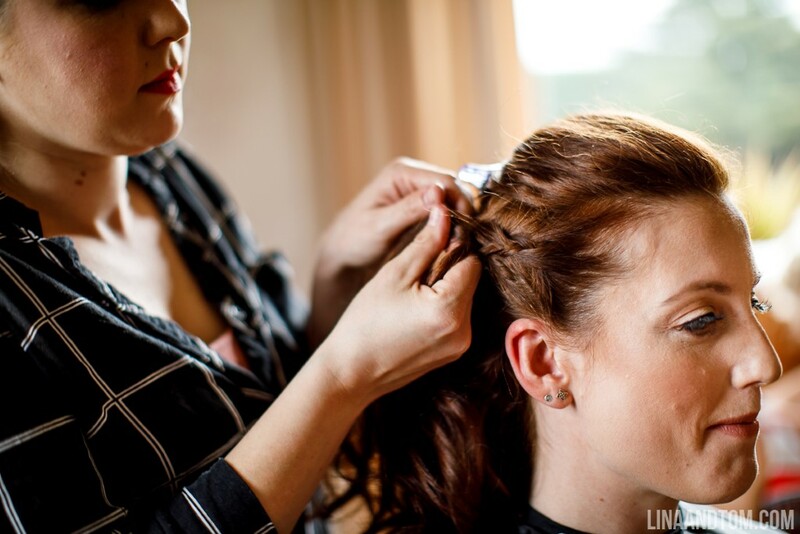 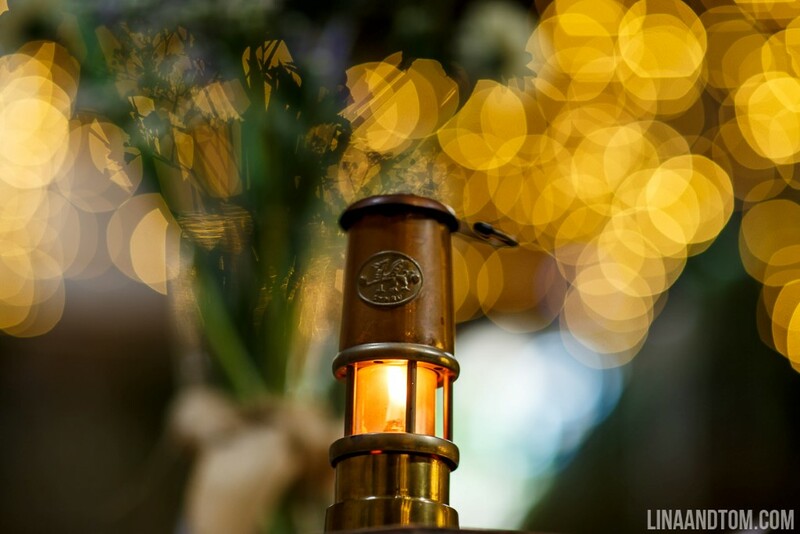 Images were captured by Lina and Tom Photography. 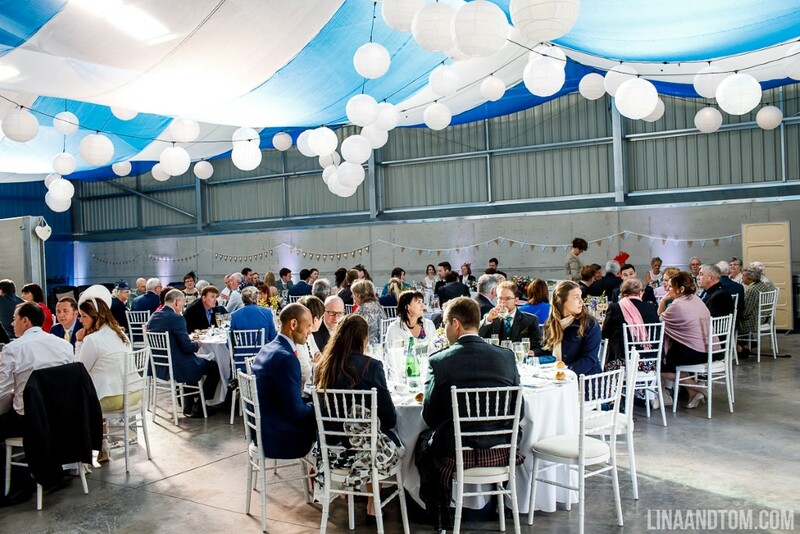 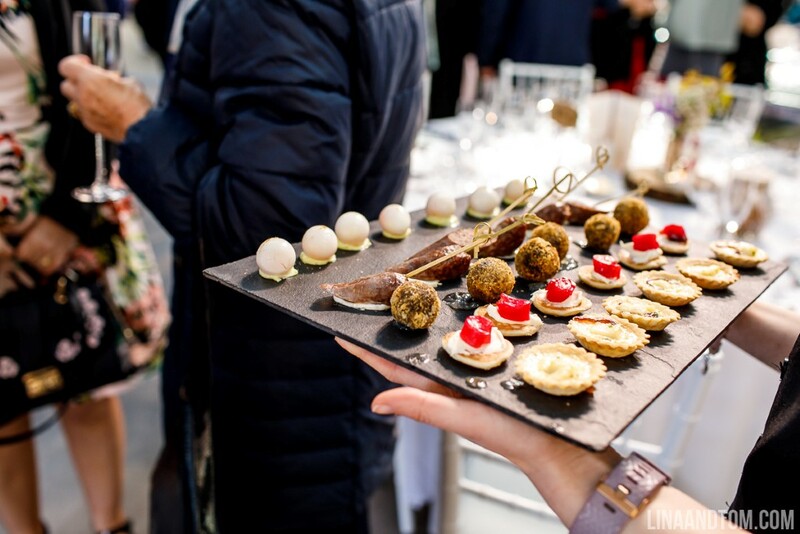 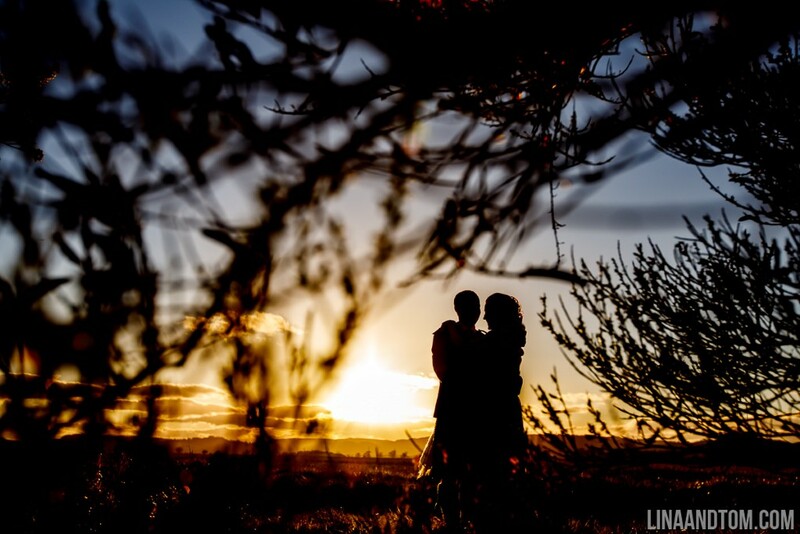 Lina and Tom are a multi award-winning husband and wife team based in Cambridgeshire but travelling up and down the UK and Internationally, specialising in documentary wedding photography, destination weddings and fun lifestyle photography. 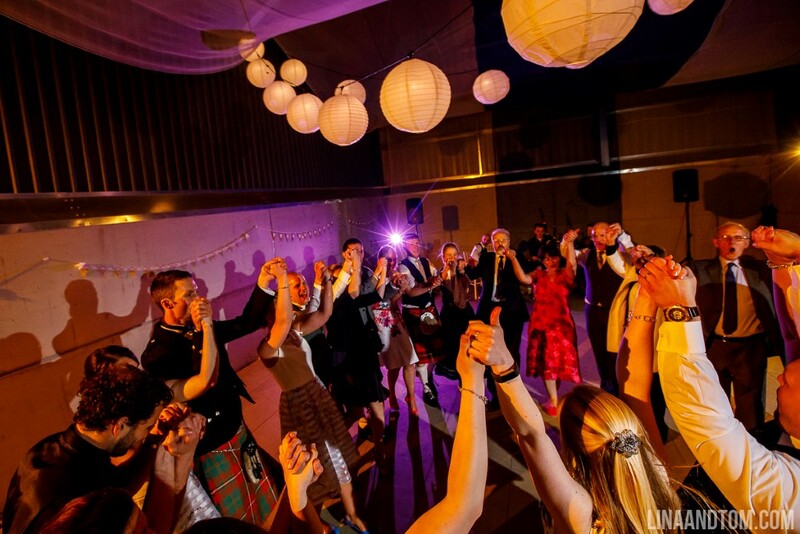 What they love most about weddings is that each one is totally unique, and they’ve been proud to be part of a huge variety of weddings – destination weddings, beautiful country weddings, bustling city weddings and multicultural weddings..
What makes them different is that they really get to you know you and your day inside out. 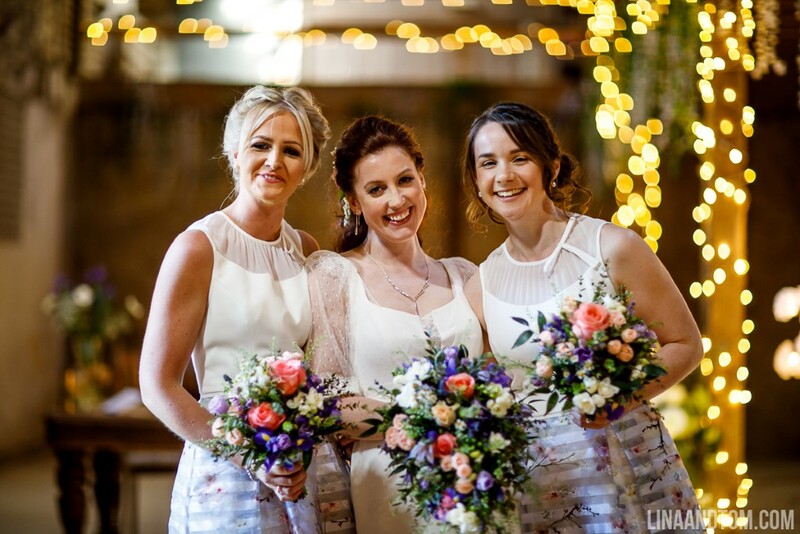 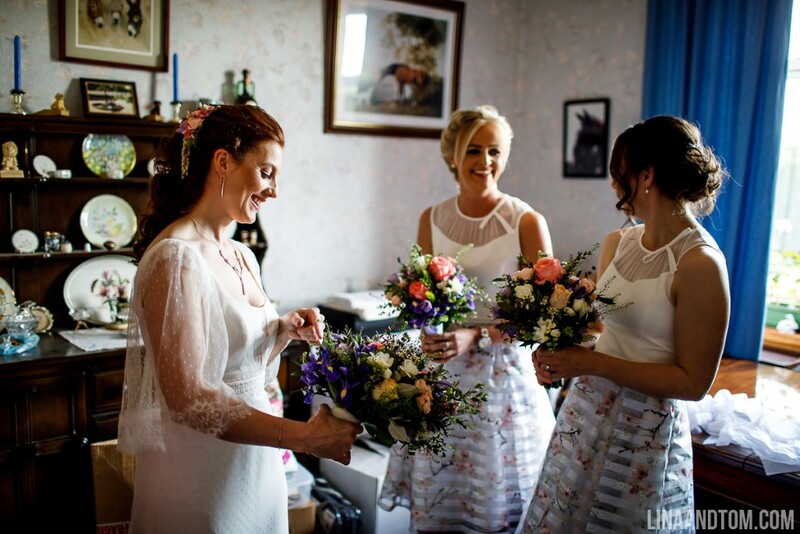 They have been 2 x winners of Wedding Photographer of the Year at the Four Counties Wedding Awards , and have multiple Fearless Photographer and Masters of Wedding Photography UK awards. 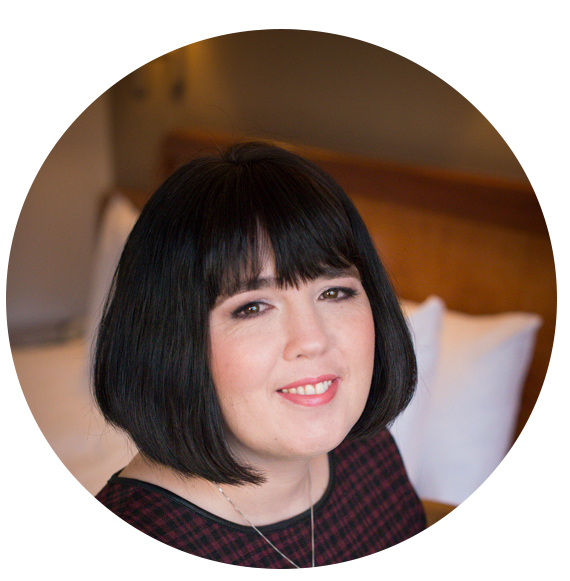 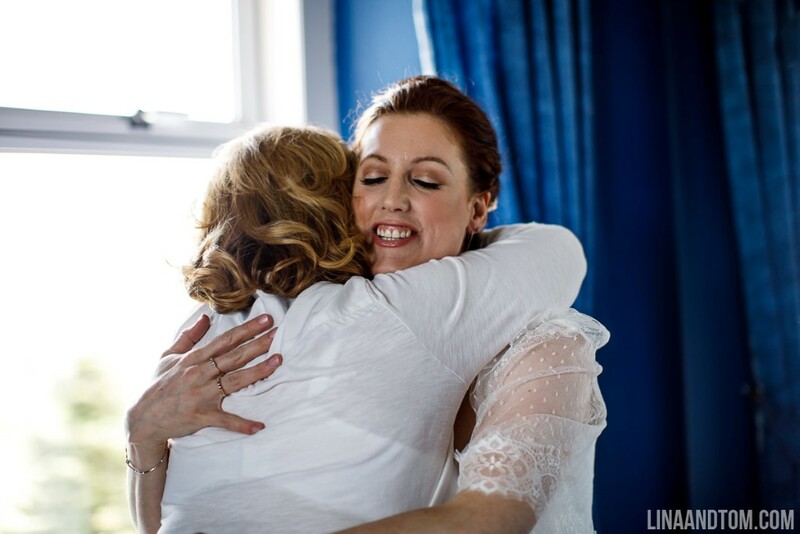 In 2018 Lina spoke at the Fearless Europe Conference in Croatia, at Jelly Bean Wedding Conference in London and was a Fearless Awards Judge. 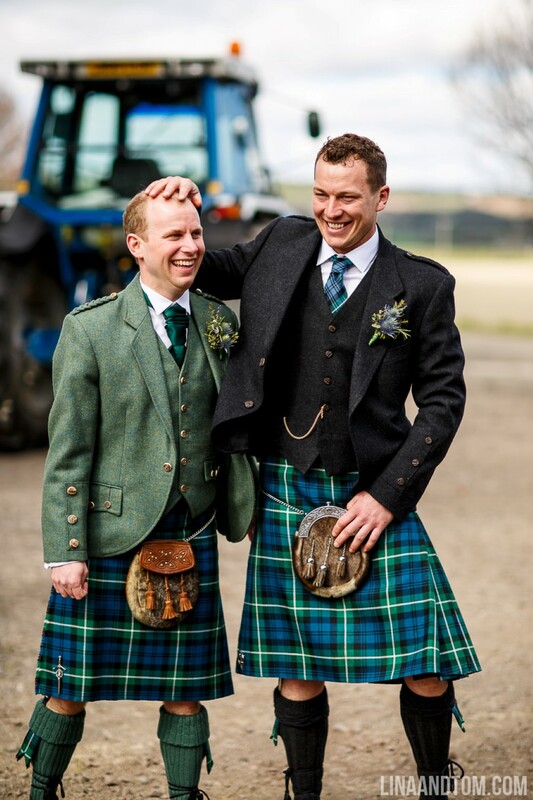 We’ve known Cat and Ewen for over ten years now, when Tom met Ewen through his then housemate, and we all became firm friends. 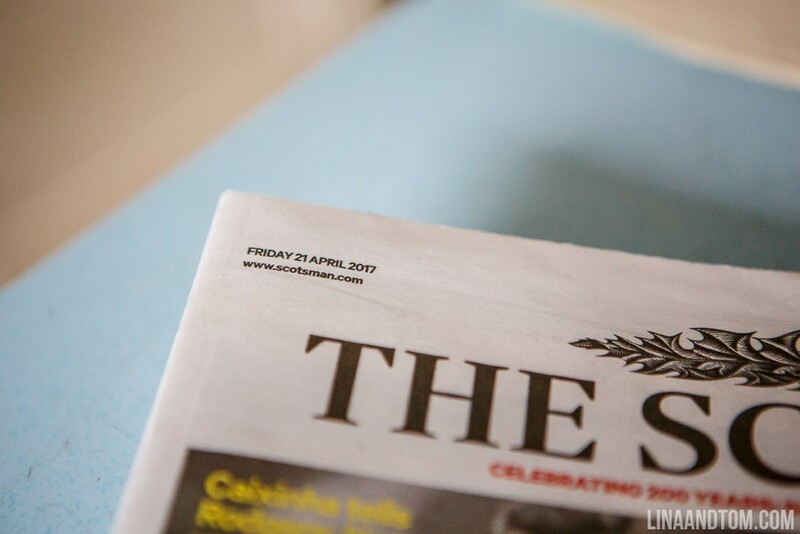 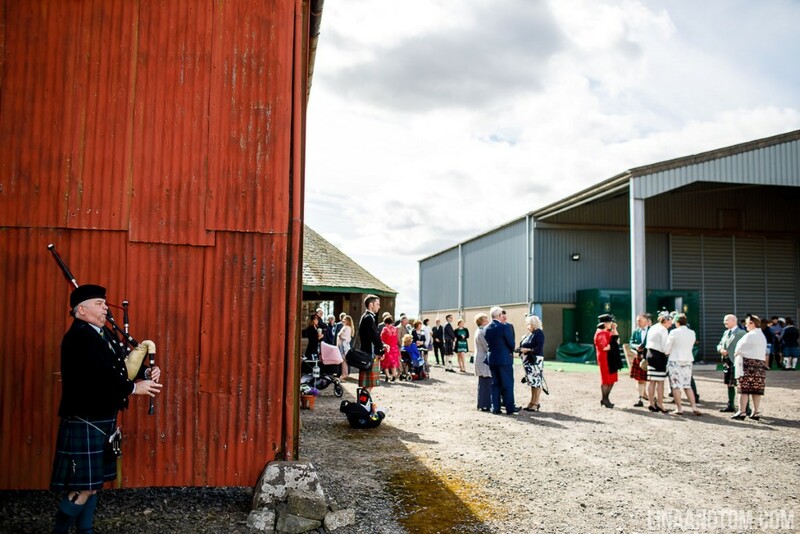 It’s always a worry as a wedding photographer that you won’t be available when your friends get married, so we were touched when Cat got in touch to check any free dates we had before they finalised the date, despite it being in difficult circumstances. 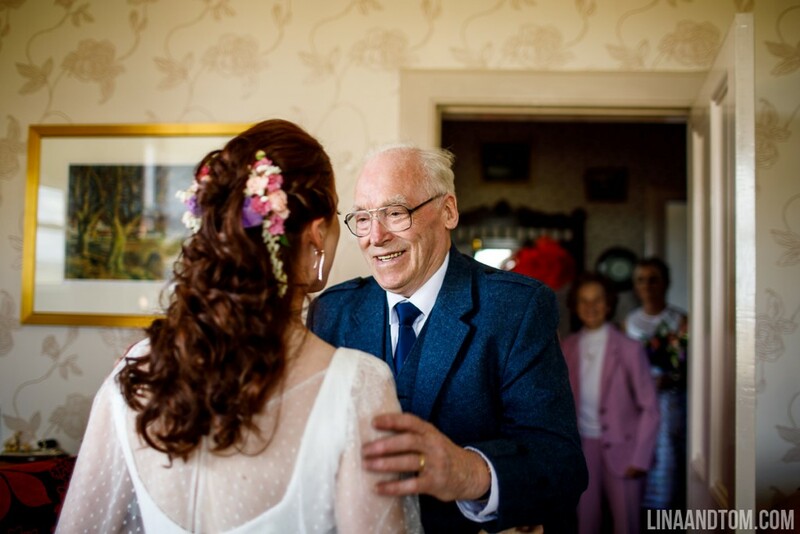 Despite the sadness that Cat’s Dad wasn’t there in person, everyone was determined to make the most of the day and there was truly a wonderful atmosphere and a lot of love for them. 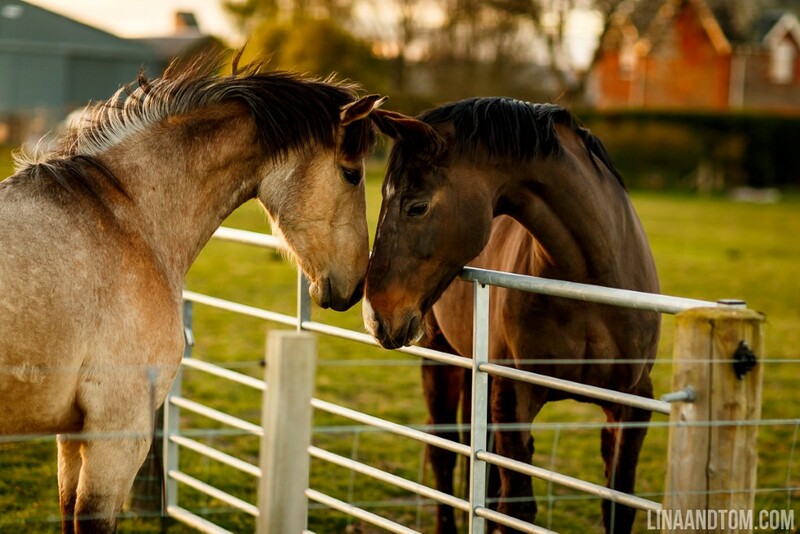 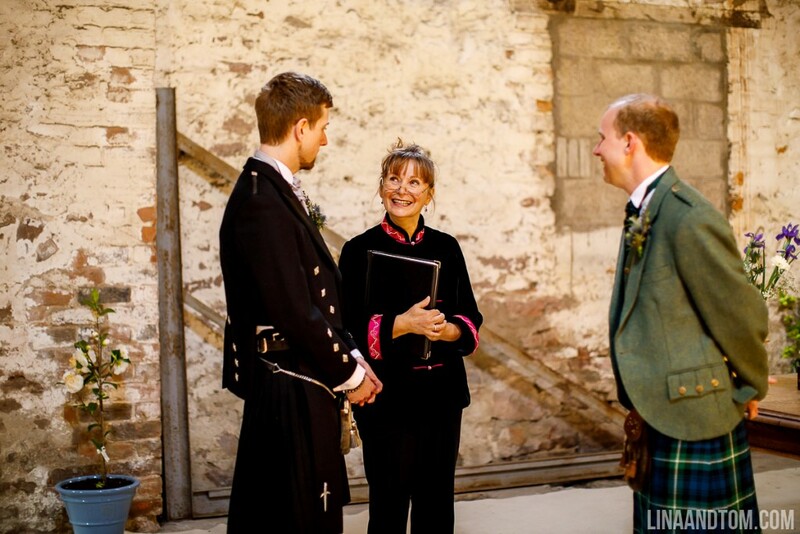 They have the loveliest, most welcoming family and friends. 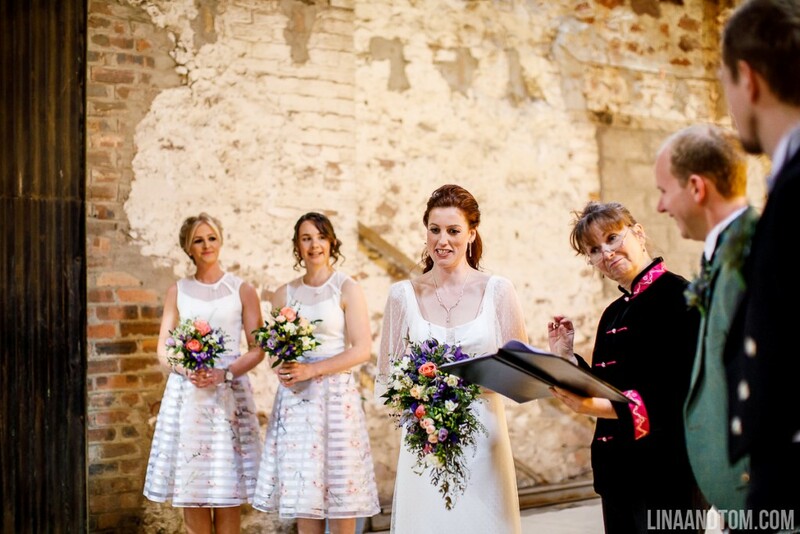 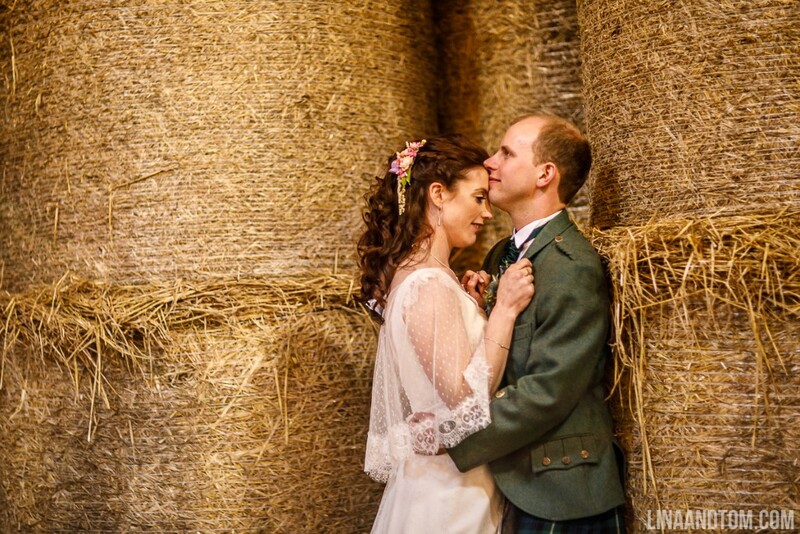 Their barn looked absolutely stunning for the ceremony and it was so lovely to see them so happy. 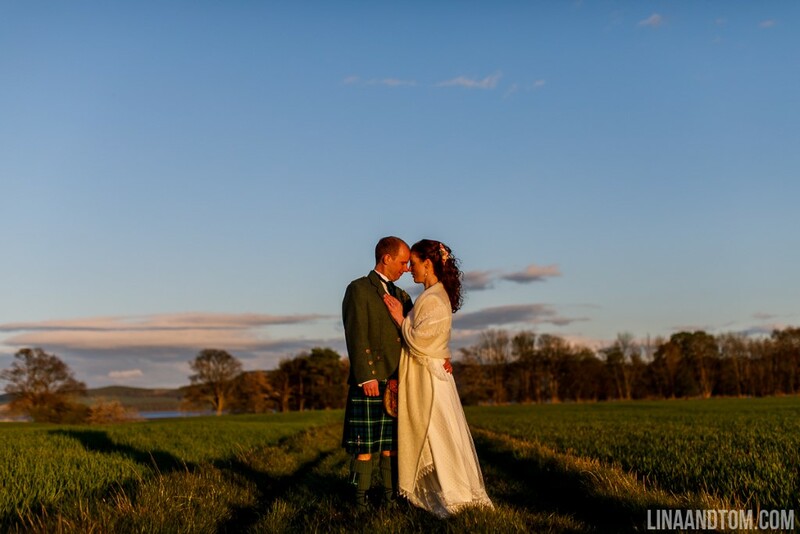 Even mother nature was in the mood for showing off, with the most incredible sunset over the farm, which seemed poignant in some way. 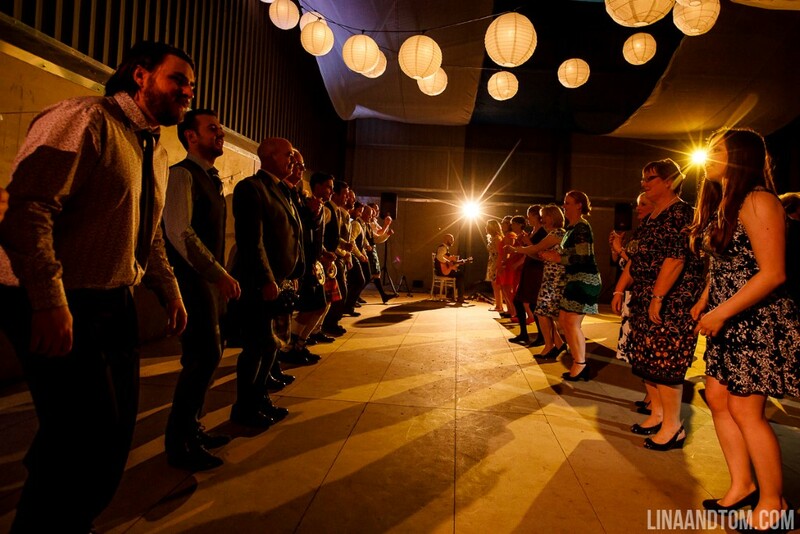 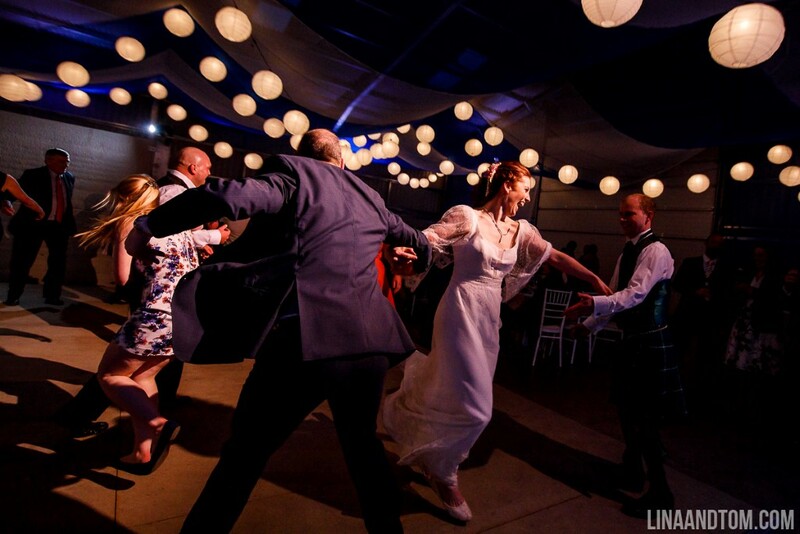 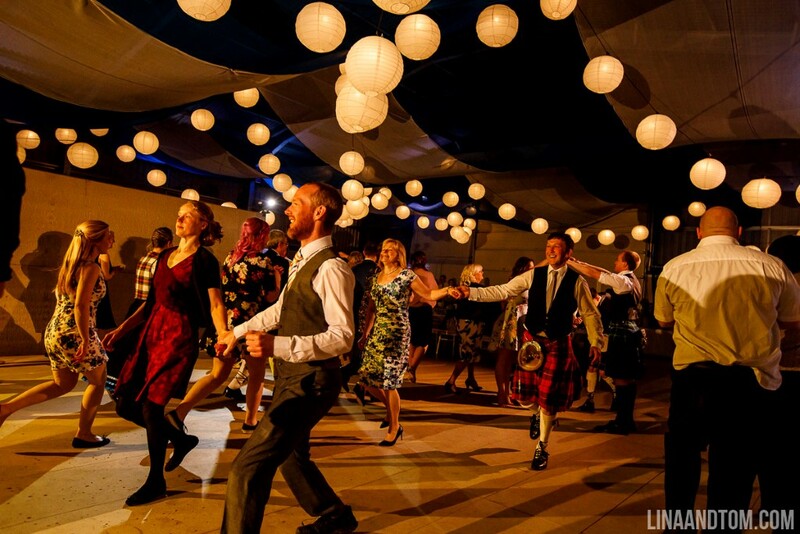 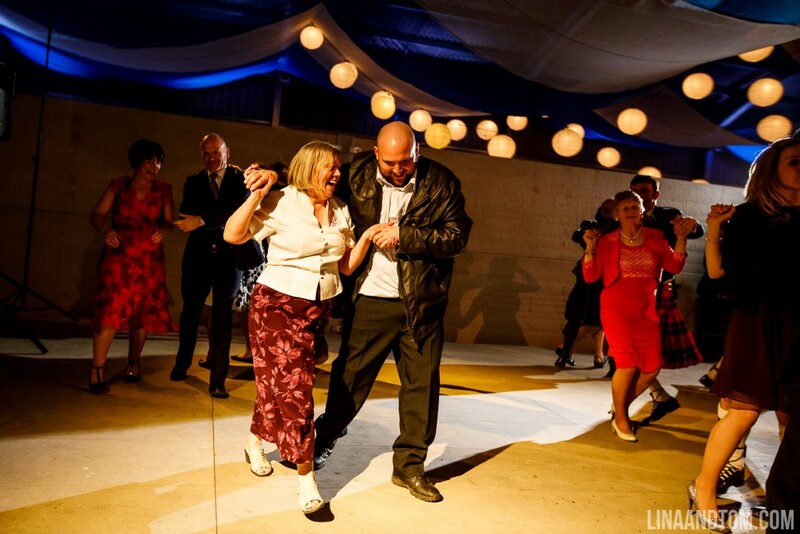 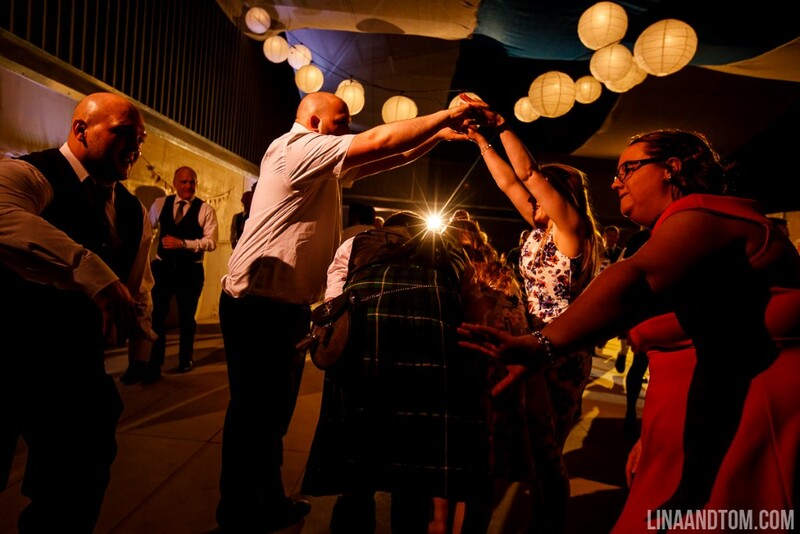 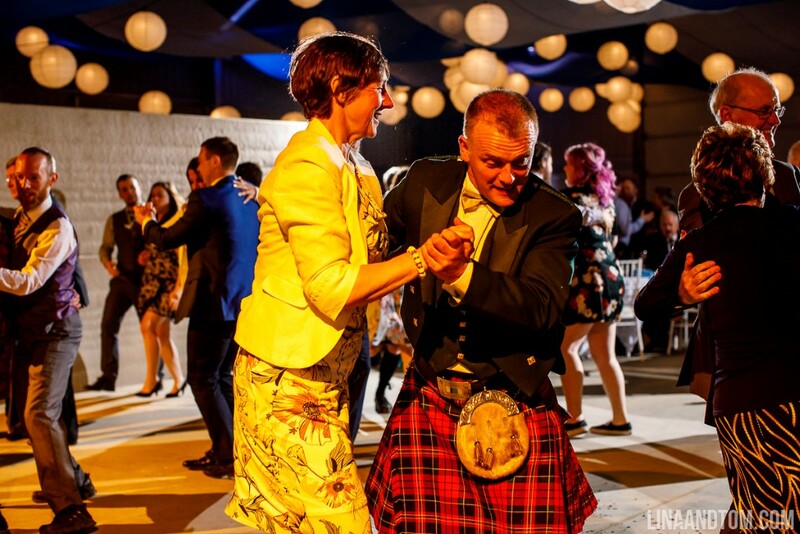 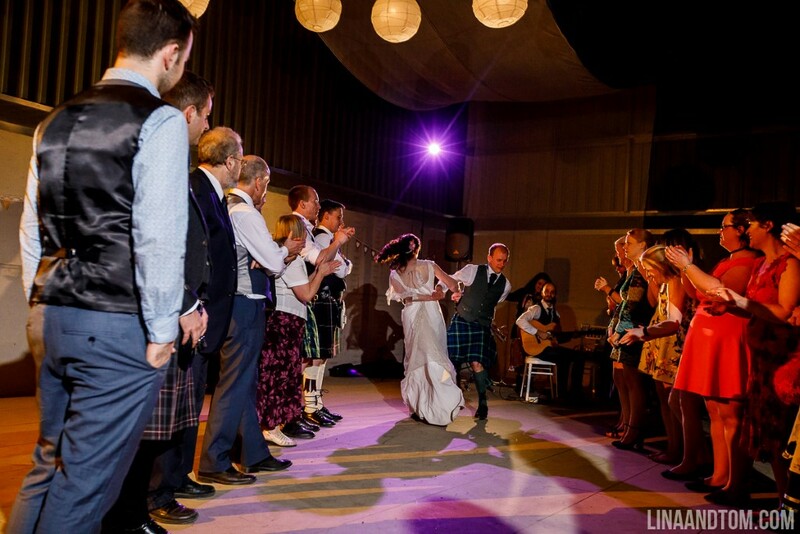 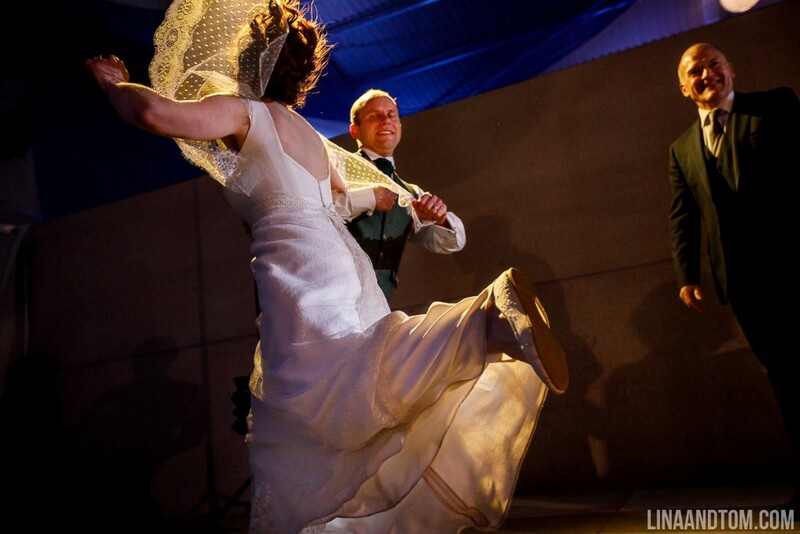 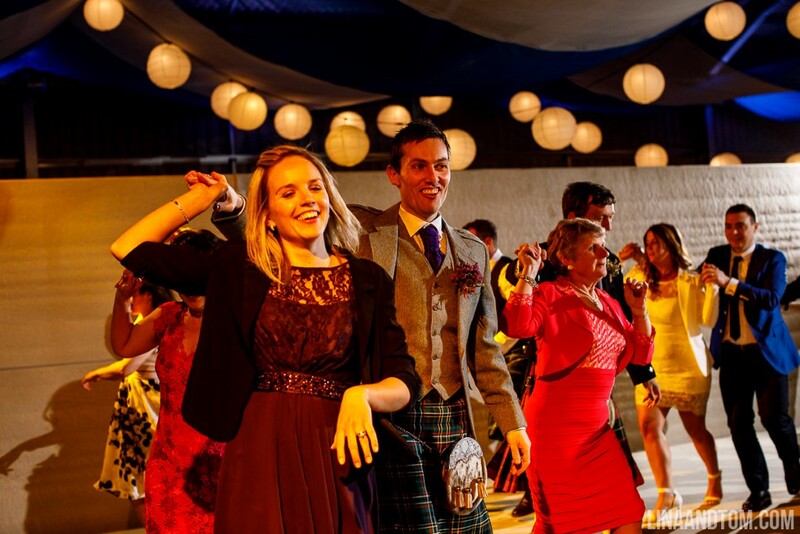 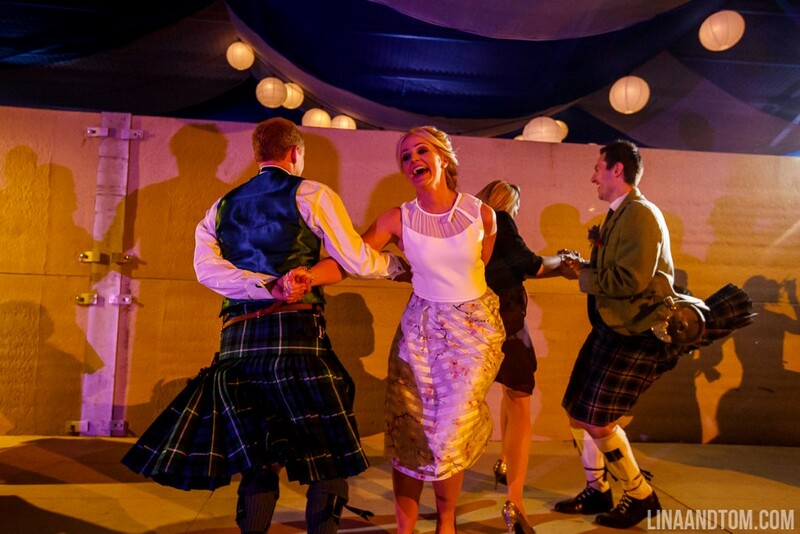 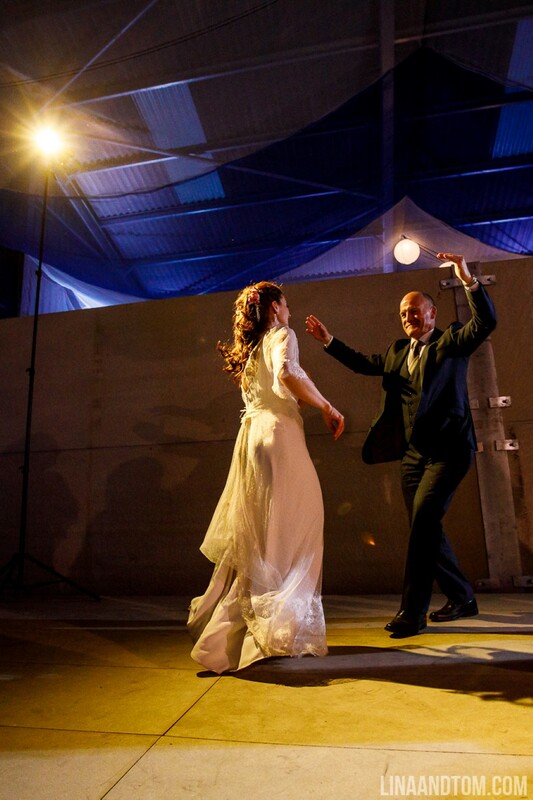 The day ended with a fantastic ceilidh which is always so much fun to shoot! 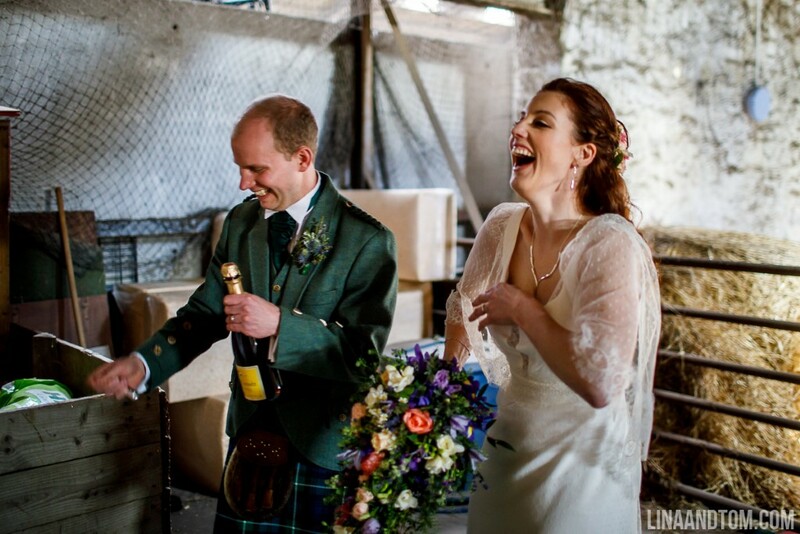 We met on Hogmanay 2008/09, we had mutual friends who were a couple and met up through them. 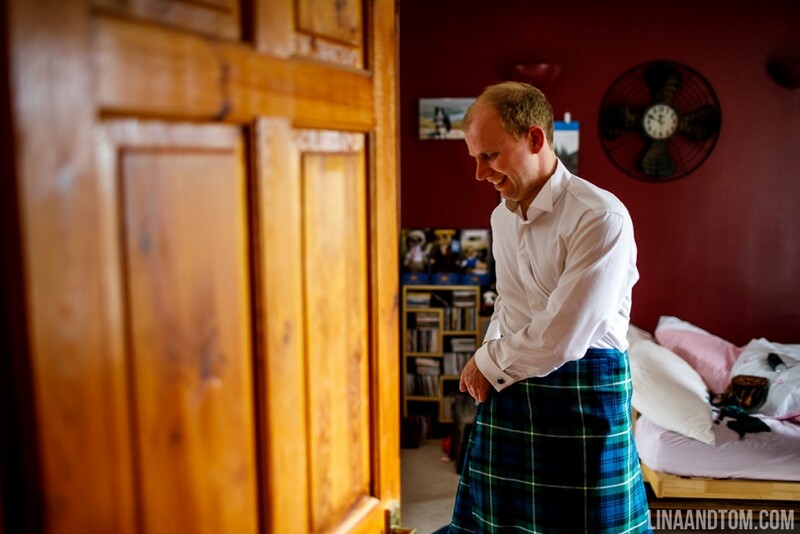 We had started the night with drinks at Ewen’s flat, and I left my scarf behind (definitely an accident! 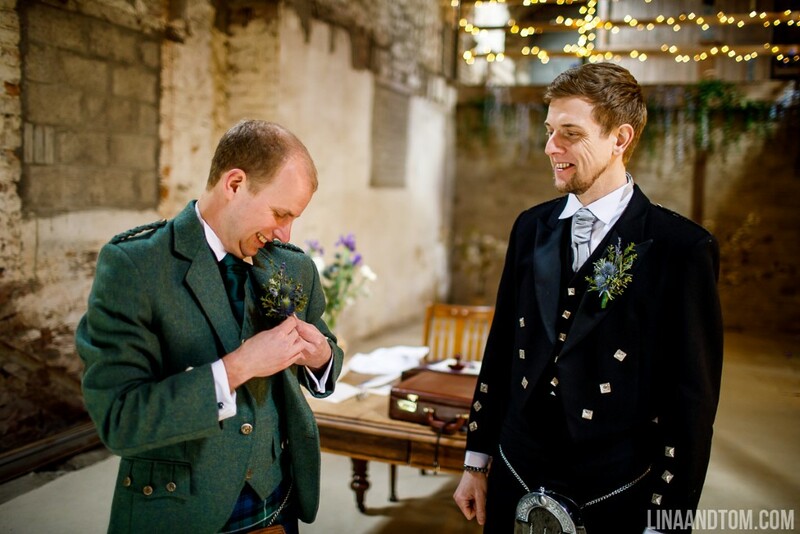 ), Ewen got in touch to get it back to me. 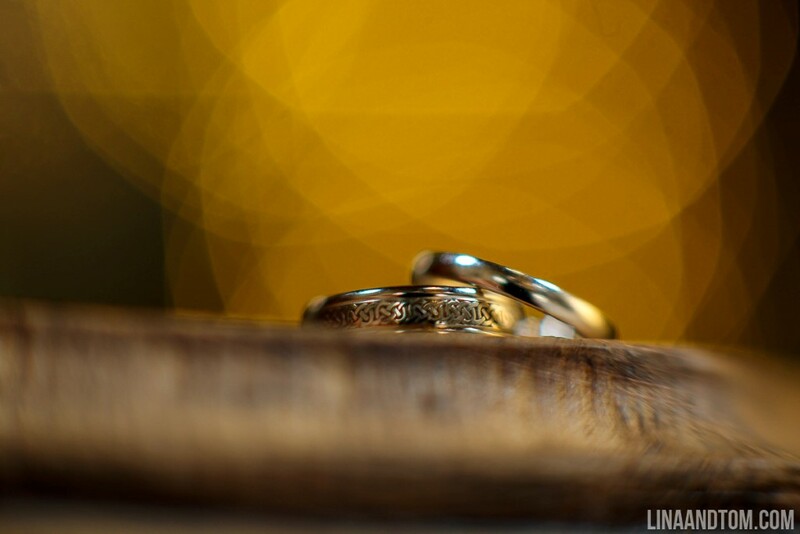 This is not so easy to answer. 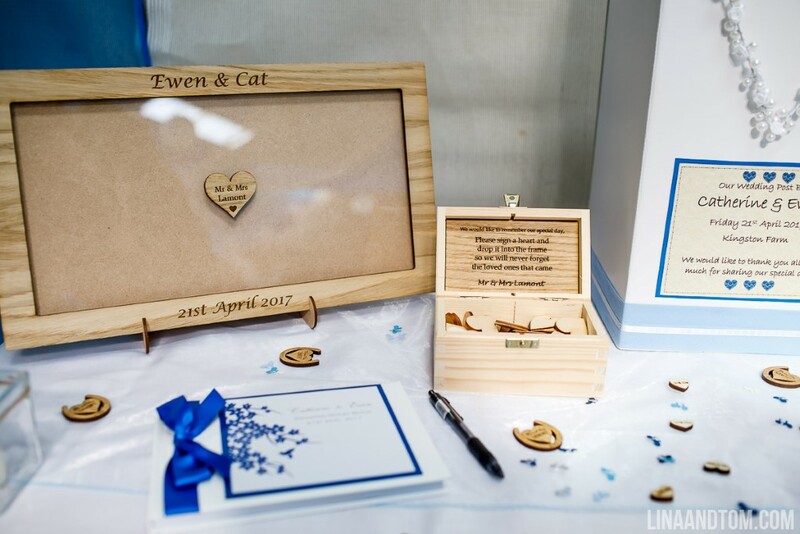 We had found out that Cat’s Dad was not going to win his battle with lymphoma so we both felt we wanted him involved and present if possible on our wedding day. 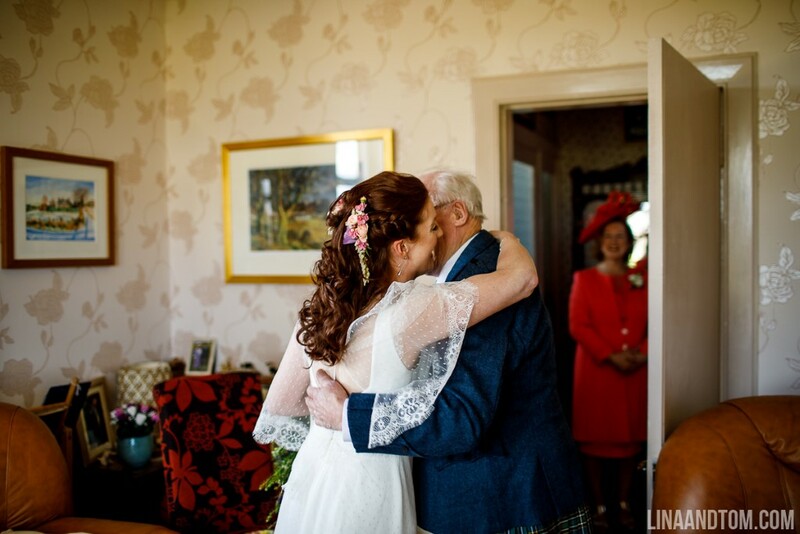 We therefore set the date for 8 weeks time, unfortunately his health deteriorated quicker than expected. 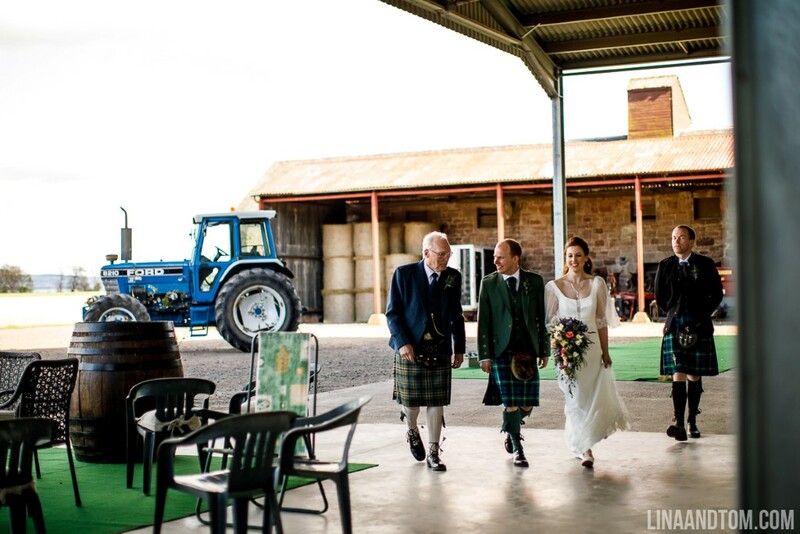 However, he knew all our plans and we had our day on Cat’s family farm and we both felt he was still with us on the day. 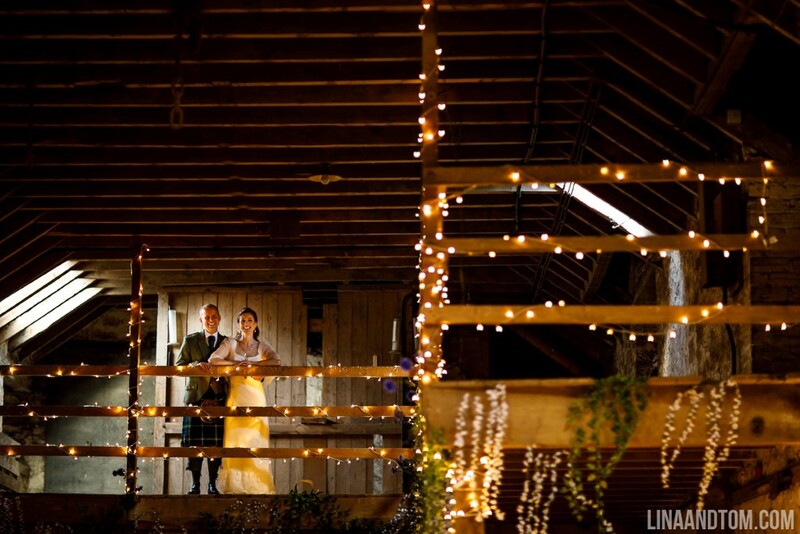 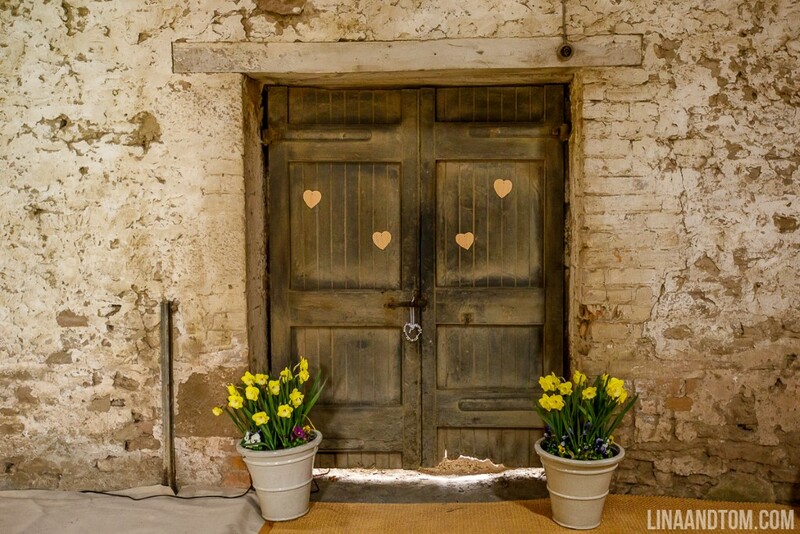 We only had 8 weeks, and 2 large, “rustic” farm sheds to turn into wedding venues! 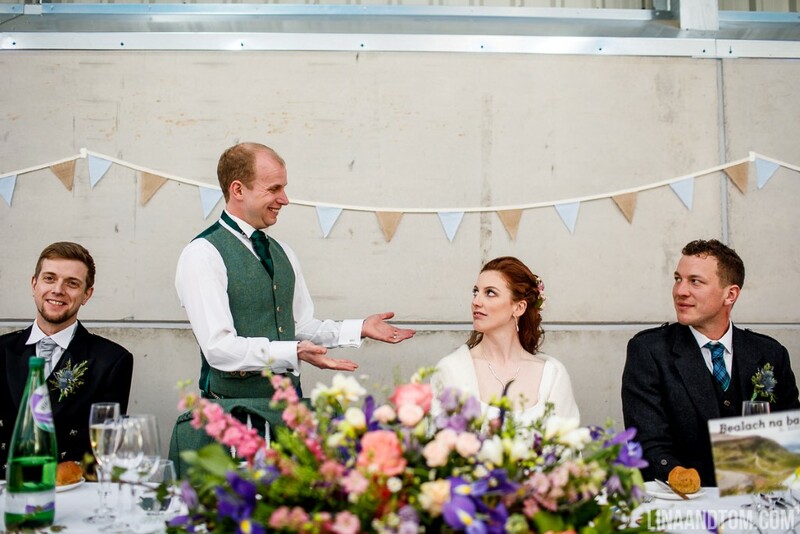 Ewen works in the wine industry and has excellent contacts, therefore he set about looking at catering while I was planning shed décor. 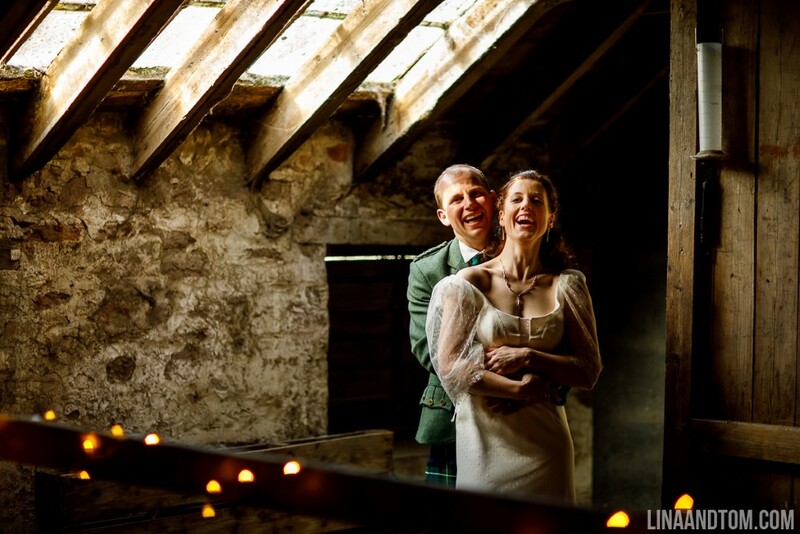 Lina and Tom are good friends of ours and we knew we really wanted them to shoot our day, we thought given how in demand they are this would be a very long shot, but we were so grateful that they squeezed us in and that set the date. 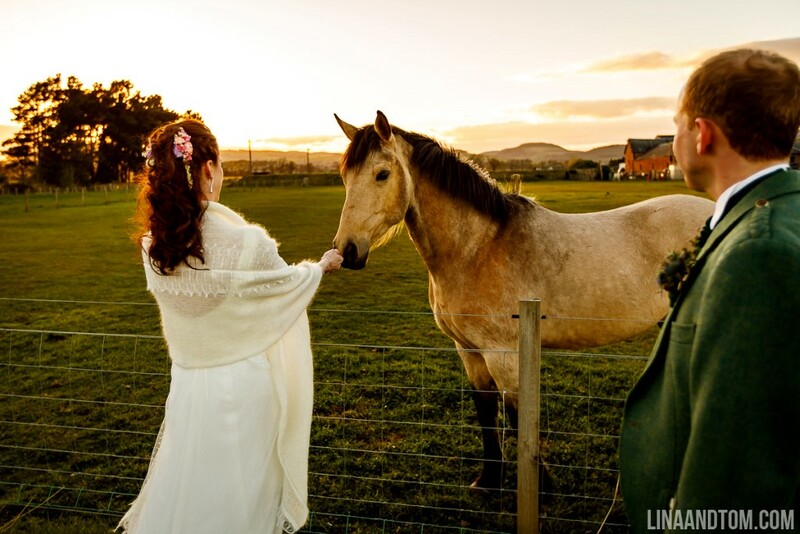 We decided a humanist wedding would suit us best, and my friend had recommended hers who was luckily available. 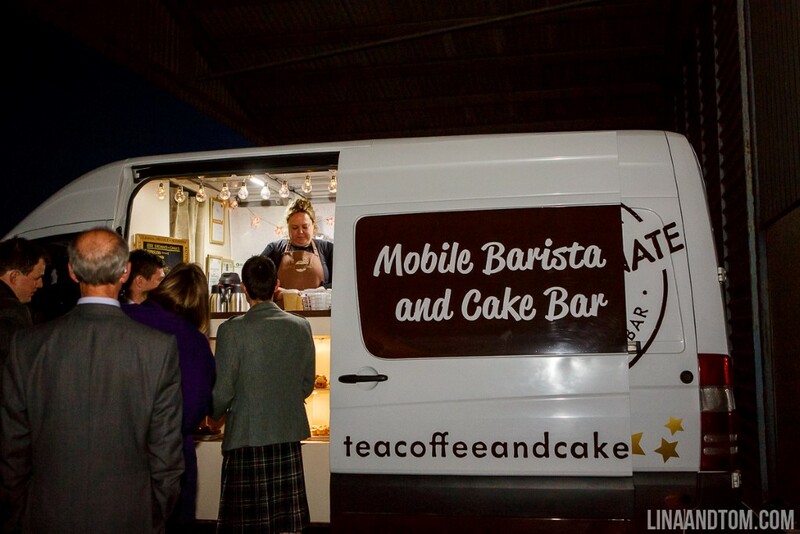 Through Sinclair’s Catering, who were amazing, we got more contacts for the other supplies we would need. 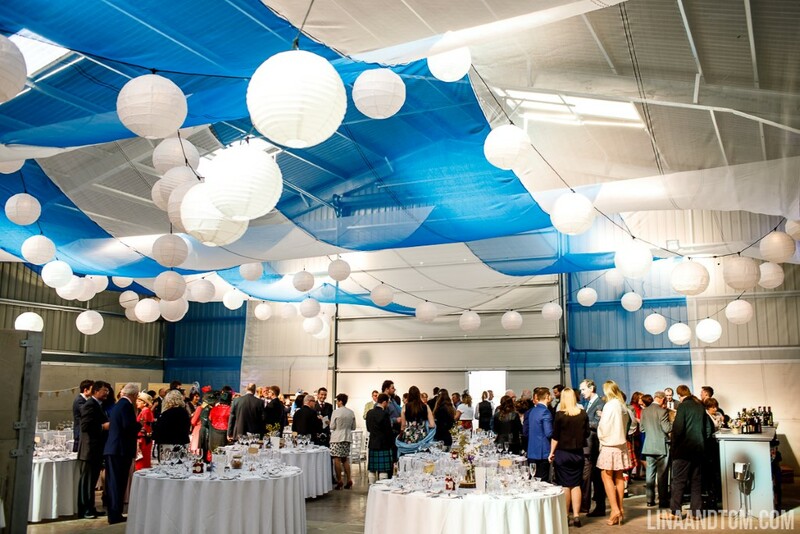 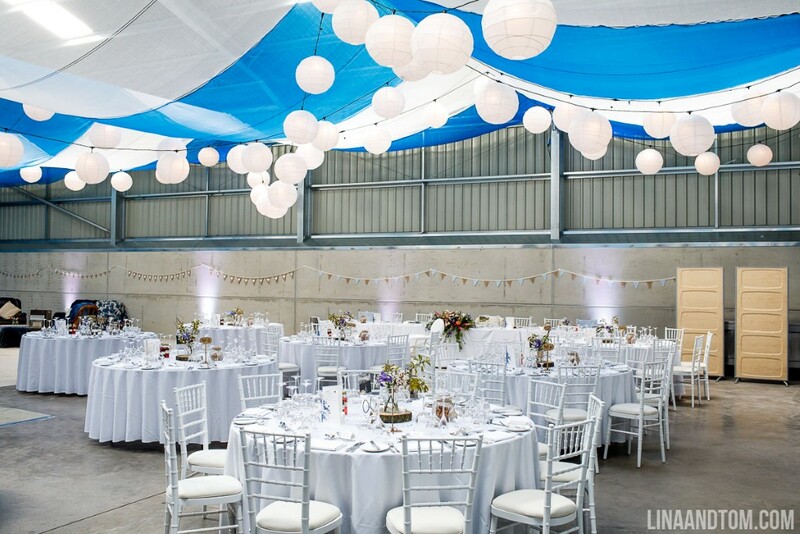 That then left a lot of hard work from us, one of my best friends and Ewen’s brother to clean up and decorate the sheds, including a near full 48 hours to drape the shed for the reception! 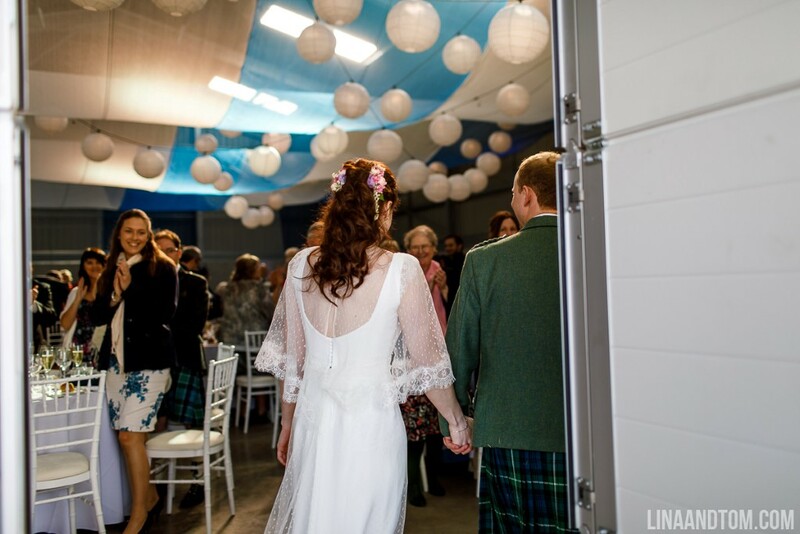 We’re still not quite sure how it all came together in the short time we had, and we’re so grateful for all the help we got. 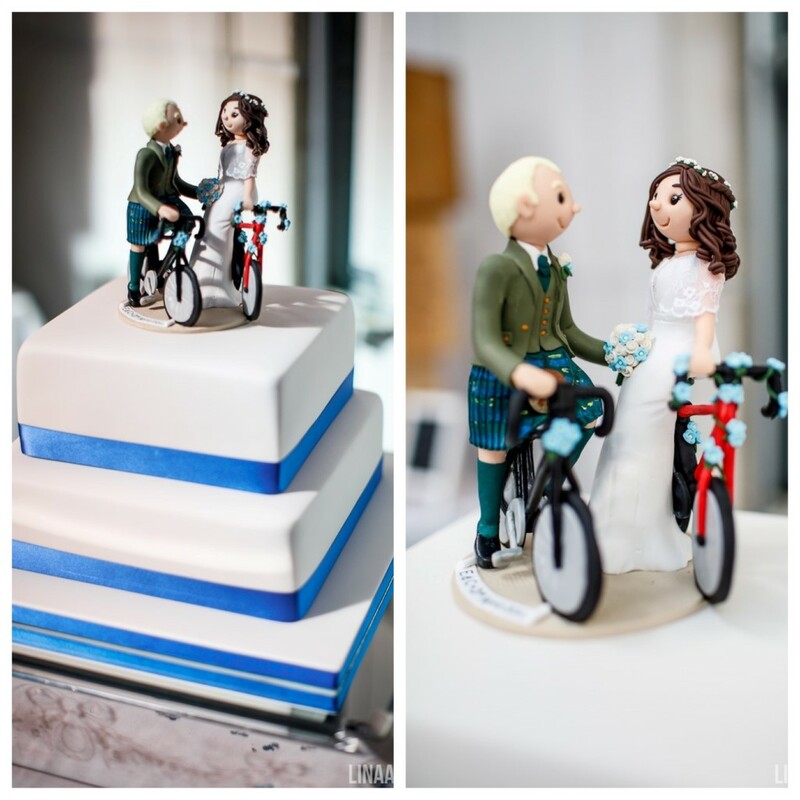 Ewen and I are both keen cyclists so we knew there had to be some cycling themes. 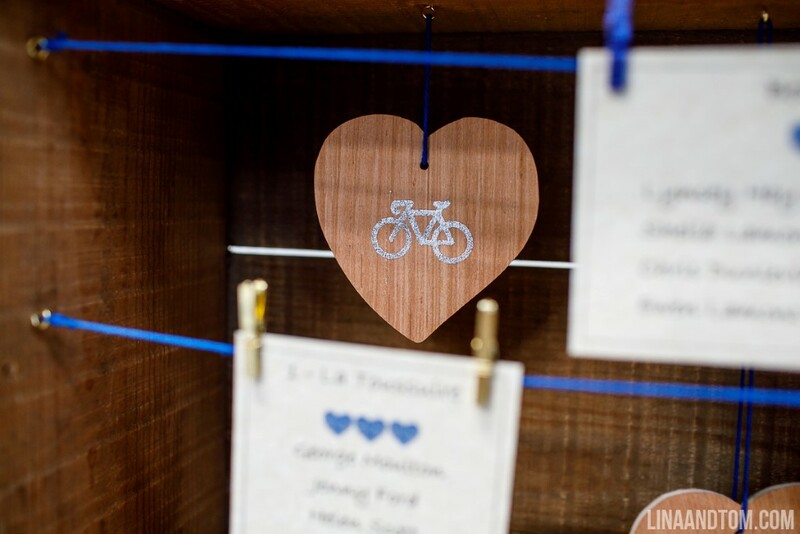 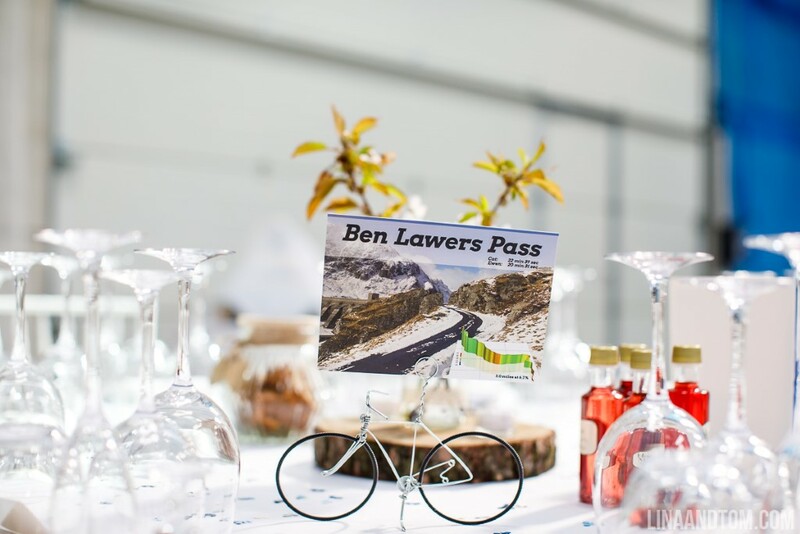 Our table names were hills/mountains that we had cycled up, with metal sculpted bikes holding table name cards that Tom helped us design. 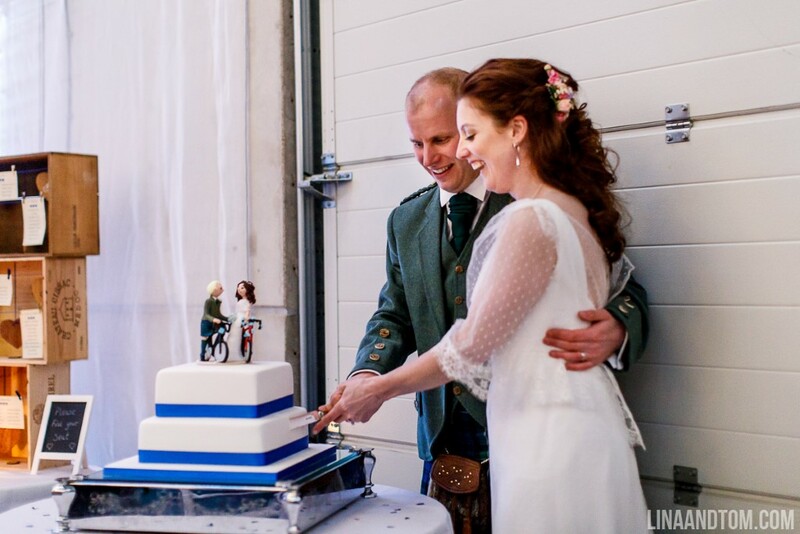 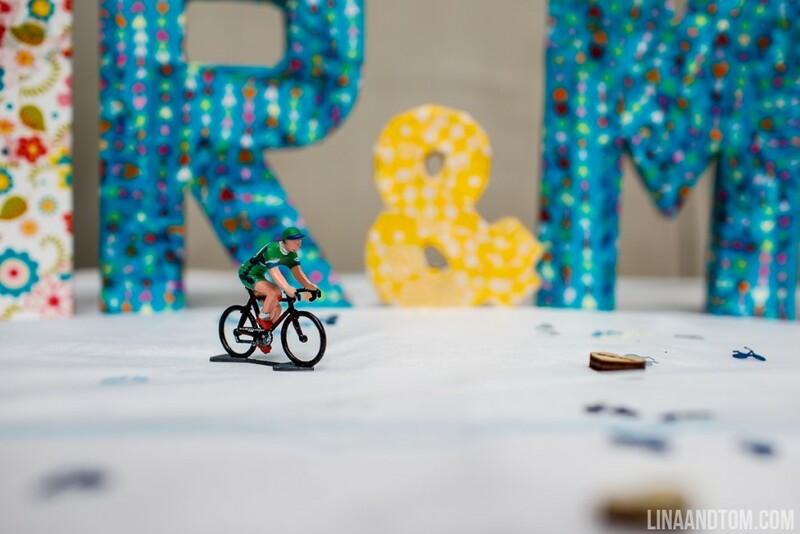 We got a beautiful cake topper of us with our bikes made, and Cat even found bike confetti all the way from America on Etsy. 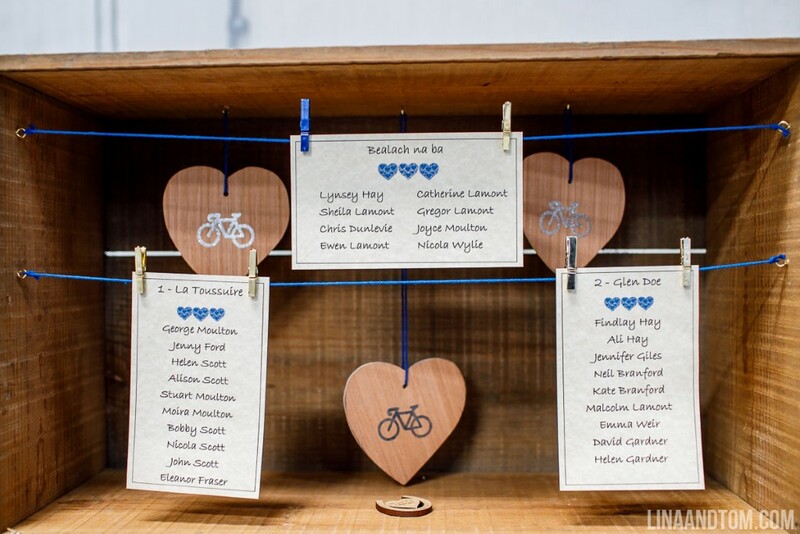 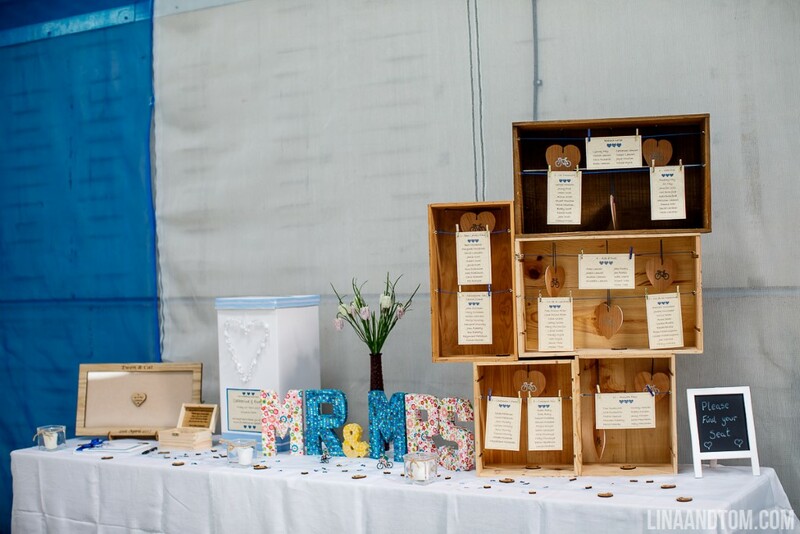 Ewen’s love of wine was acknowledged as I made our table plan out of wooden wine boxes. 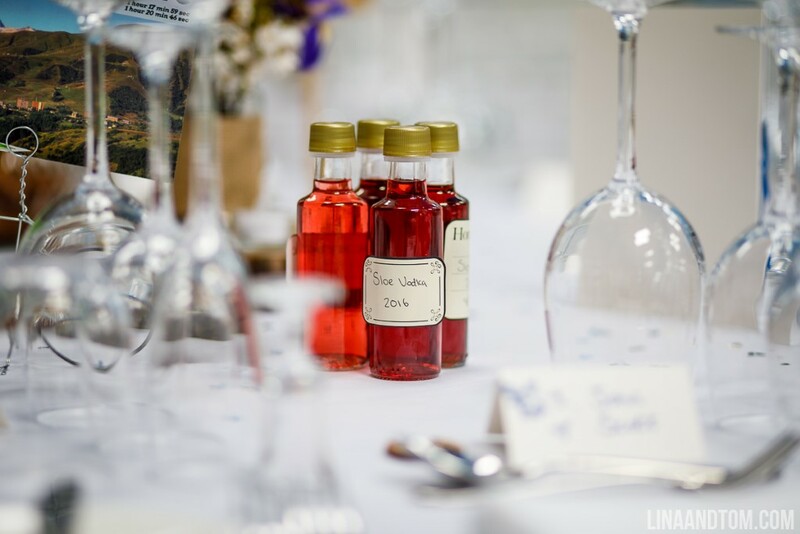 My mum makes various flavoured vodkas and gins, therefore all tables had little bottles of this, as well as jars of her homemade tablet. 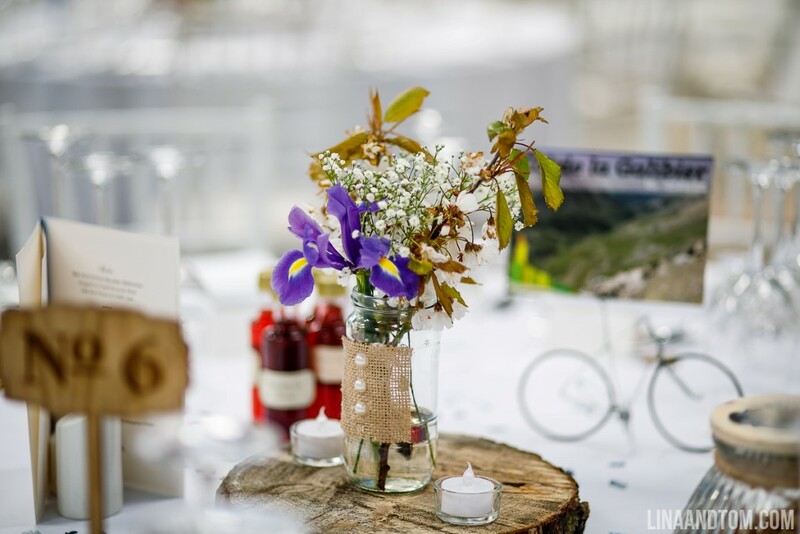 The table centrepieces were made including freshly cut blossom off the trees on the farm, and arranged by a close family friend. 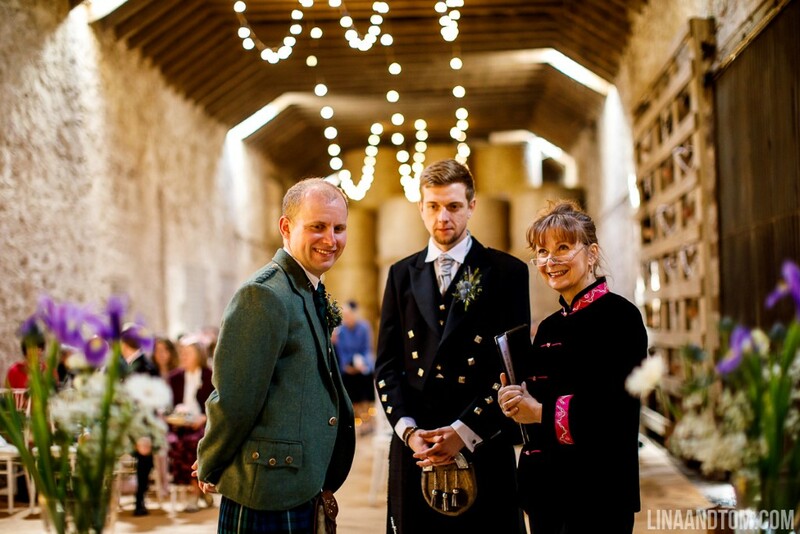 Ewen had also lost his father several years before and we both wanted them to be part of the day, therefore we had a lamp lit for them for the whole ceremony. 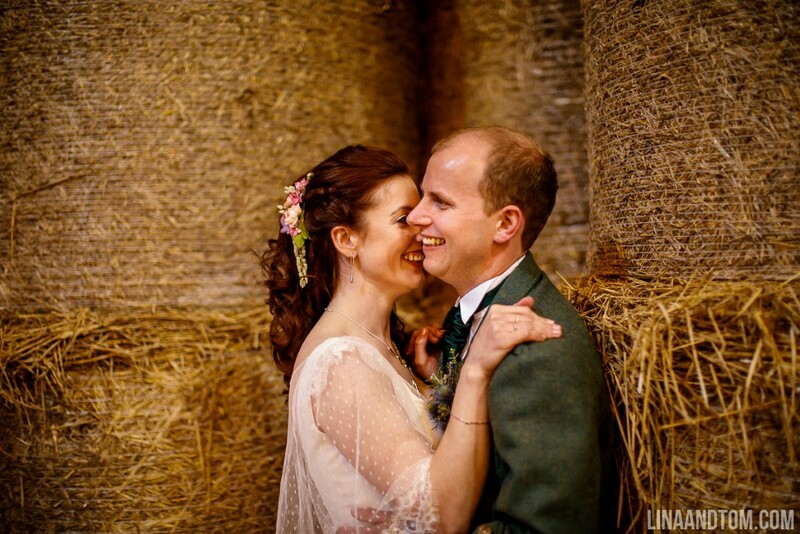 Definitely the biggest DIY accomplishment was draping of the massive grain shed. 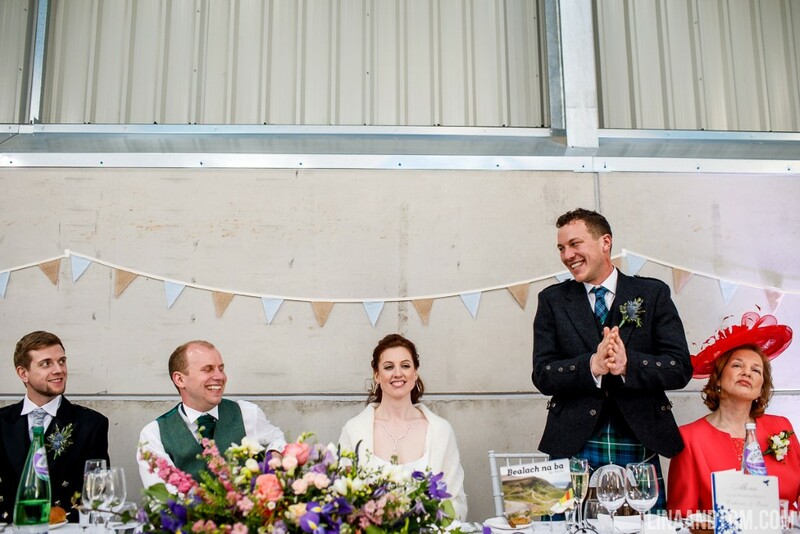 We are lucky that Ewen’s brother is a scaffolder so he rigged solid wires to hang it from, interestingly it was actually blue and white rolls of scaffolding netting!! 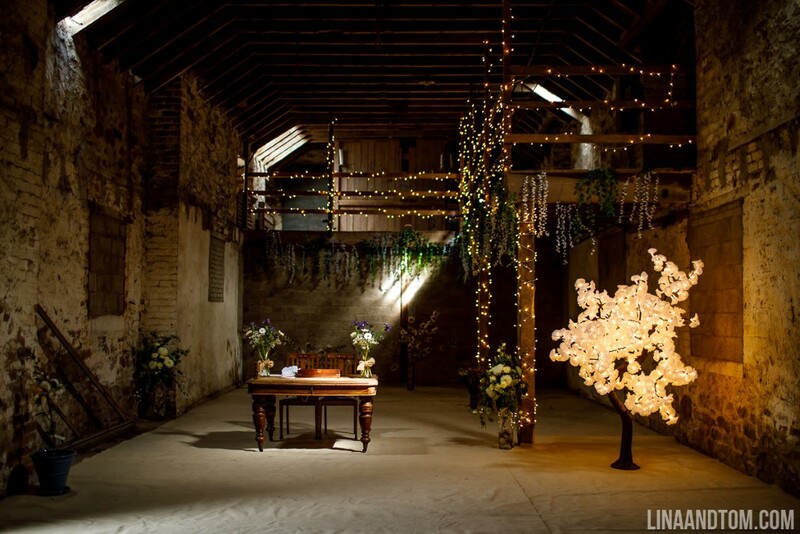 An idea from the fabulous lighting man Steve. 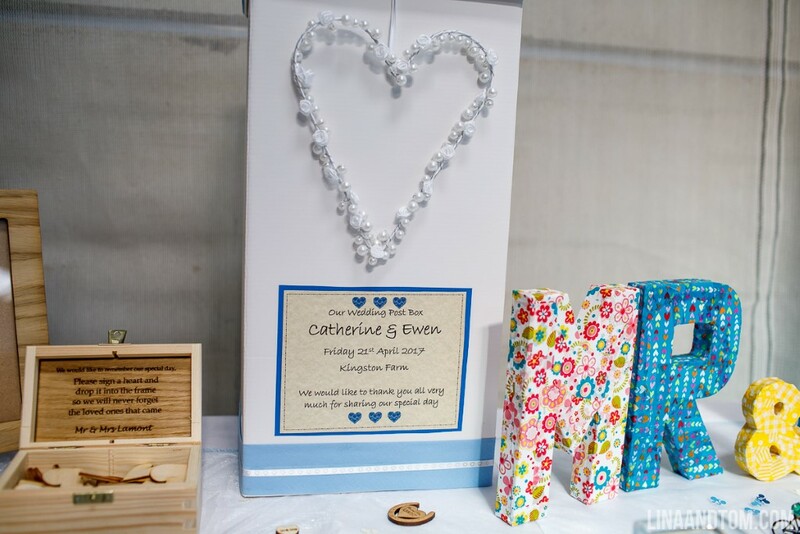 However, a rather bemused company couldn’t quite understand Cat’s desperation when she phoned to say they had delivered black instead of blue and it had to be changed right away!! 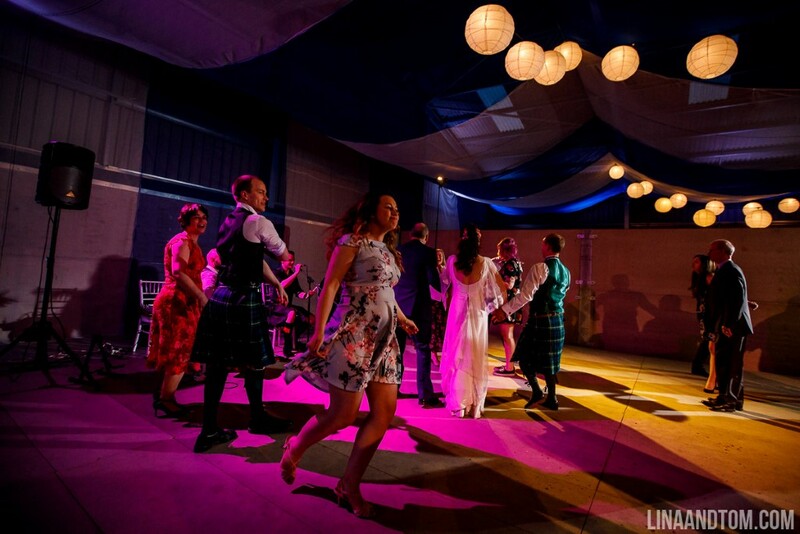 The other big project was the dance floor, we had friends who had made their own wooden dance floor, and we were so grateful that they not only lent it to us but came and put it up for us. 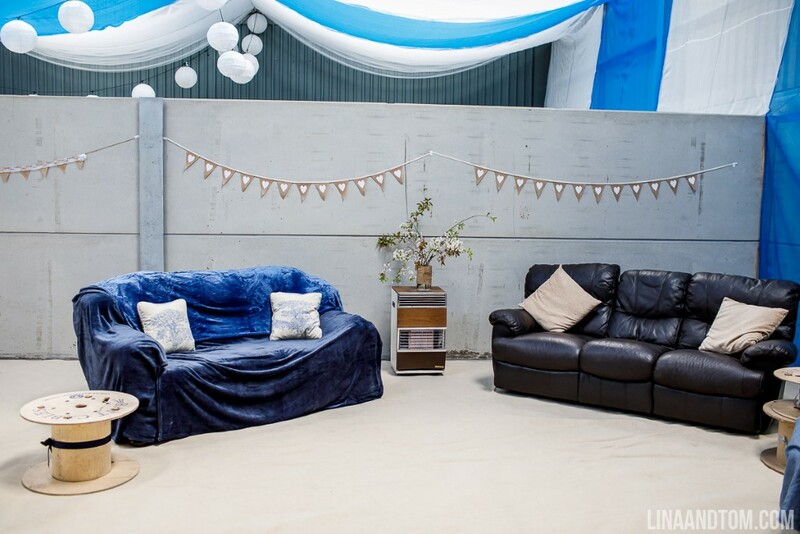 We also decided that we wanted a cosy area for guests to relax, so we collected old sofas from far and wide (including one of our caterers’ parents!) 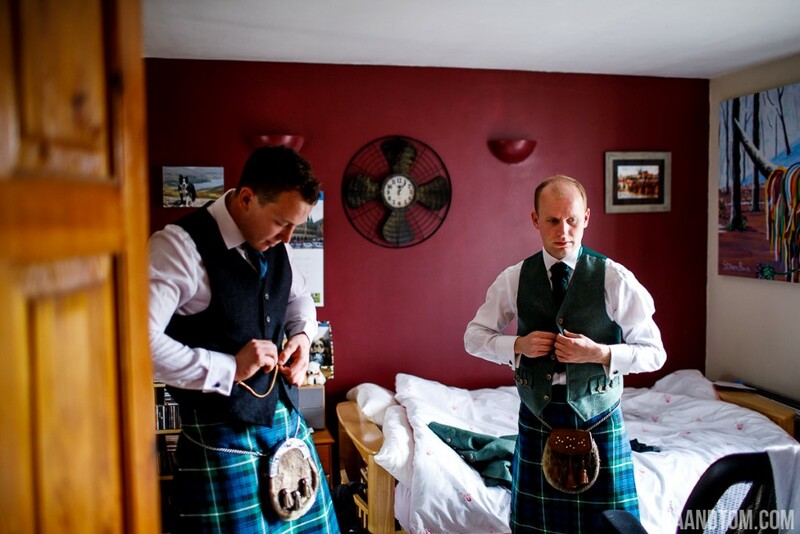 then covered in matching throws and made tables out of old large cable reels. 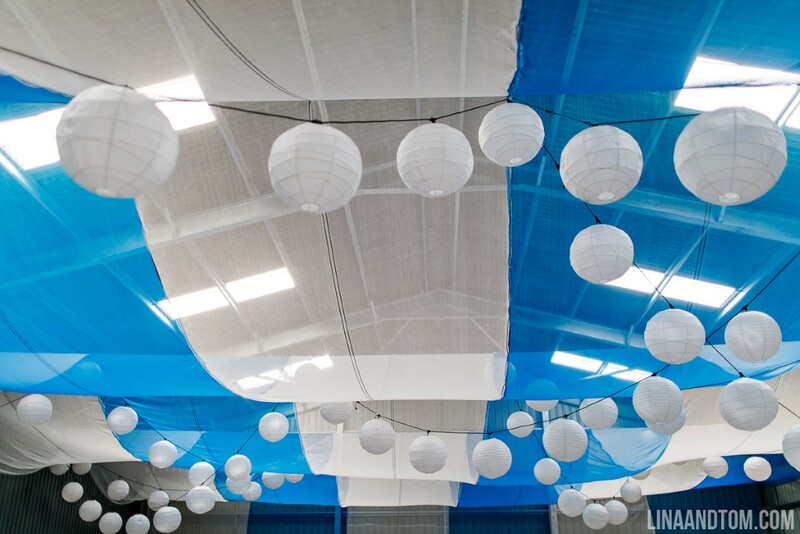 It looked so pretty. 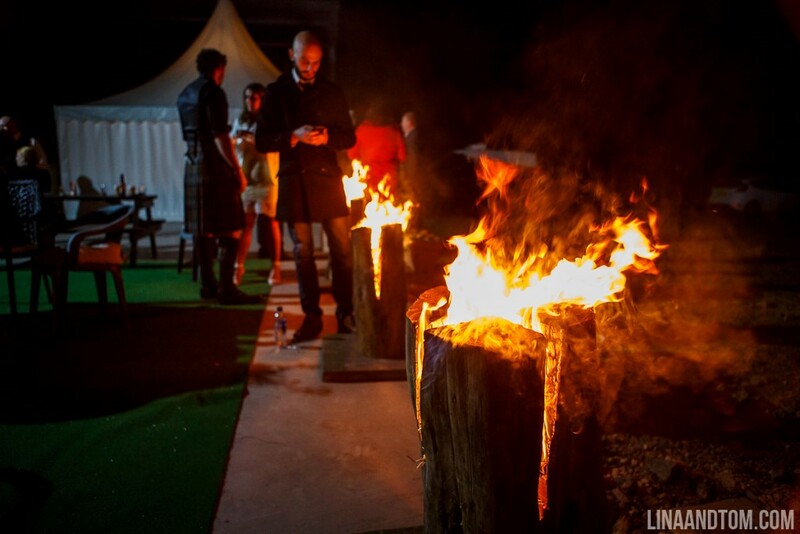 Ewen’s brother also came up with the idea of lighting Swedish candles outside, these are large logs with x shaped cut outs that you light and they burn down, we had some aged tree trunks that my dad had cut and these did the job perfectly. 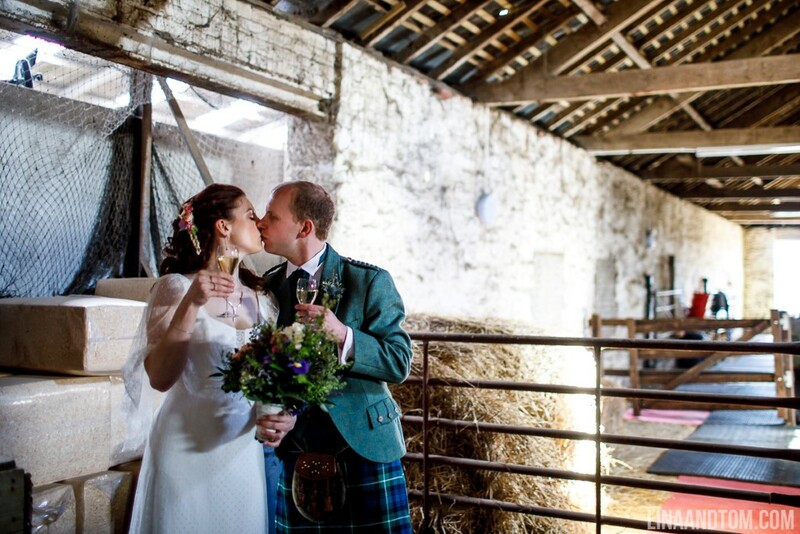 As I said before, we only managed it all with a lot of help from family friends and the local farming community, from helping to empty the sheds, to providing flower arrangements or a massive heating cupboard to keep us all warm, it made the day all the more special. 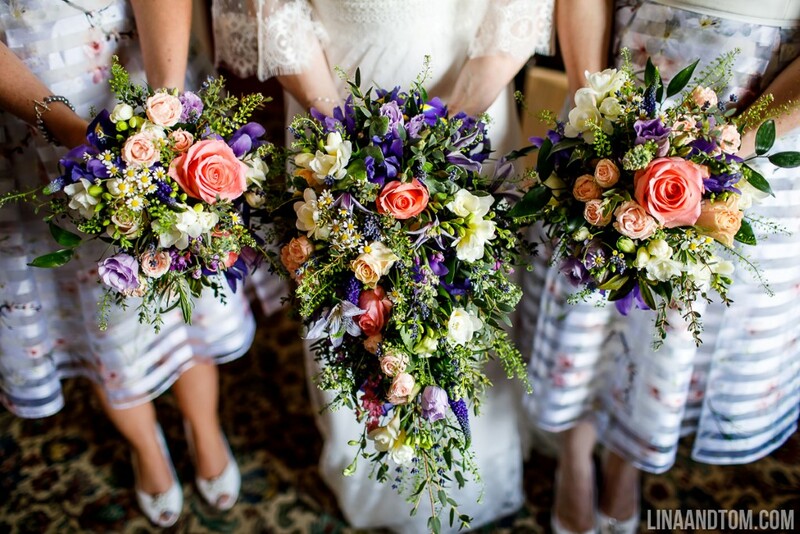 There were a few themes as described above, the main colour palette was blues/purples, but just mainly bright spring colours. 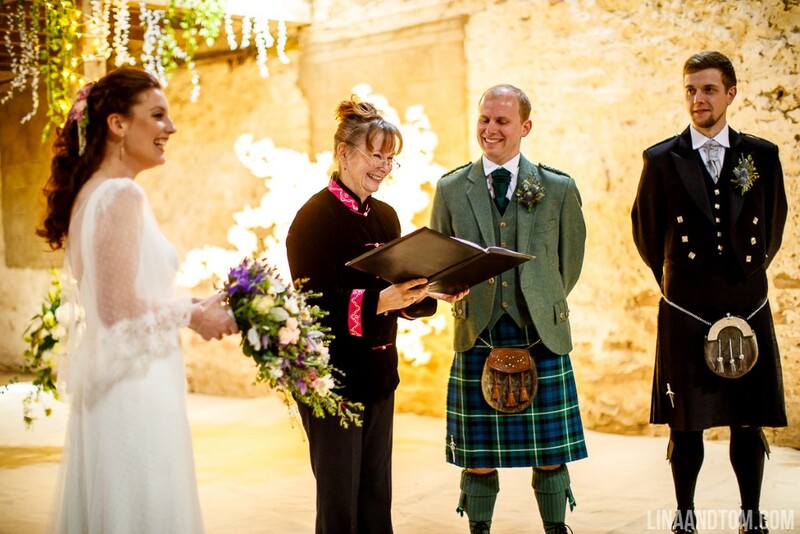 We both feel the best part of the day was our incredibly personal ceremony, with all the people we love best in the world there with us. 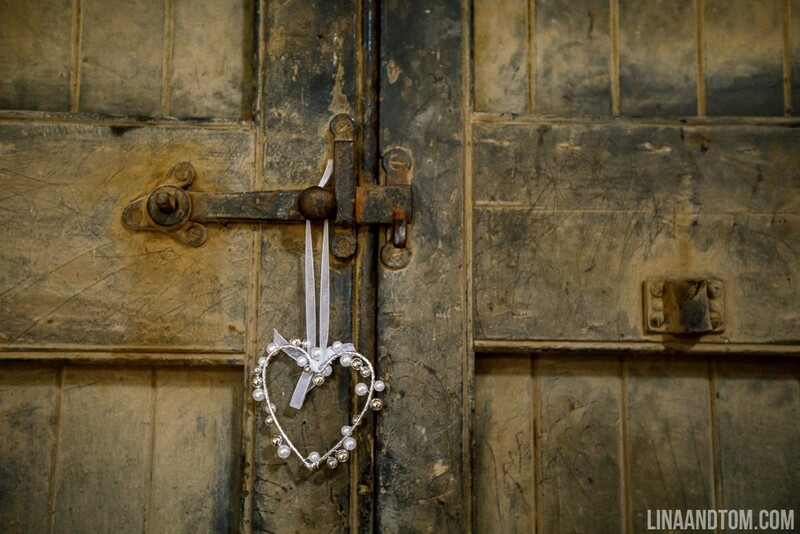 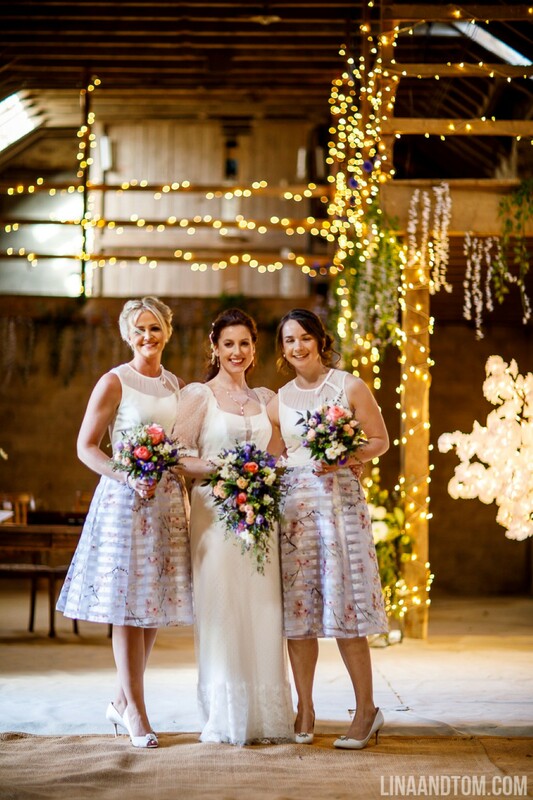 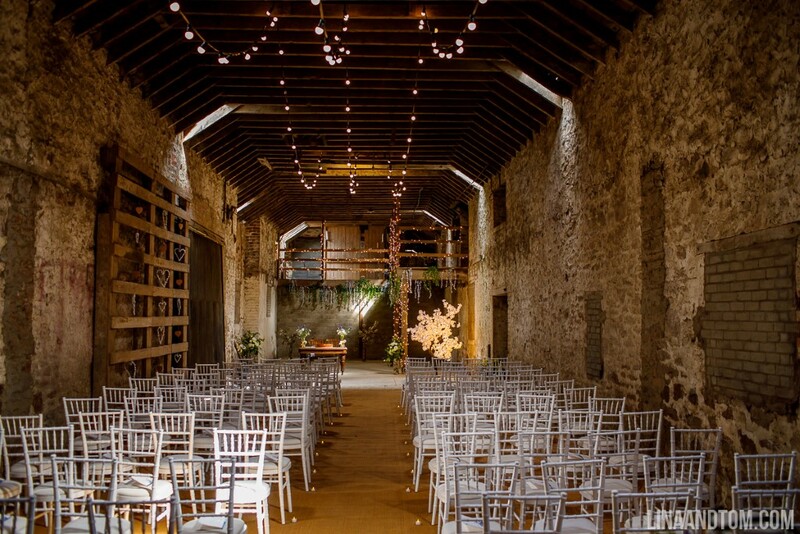 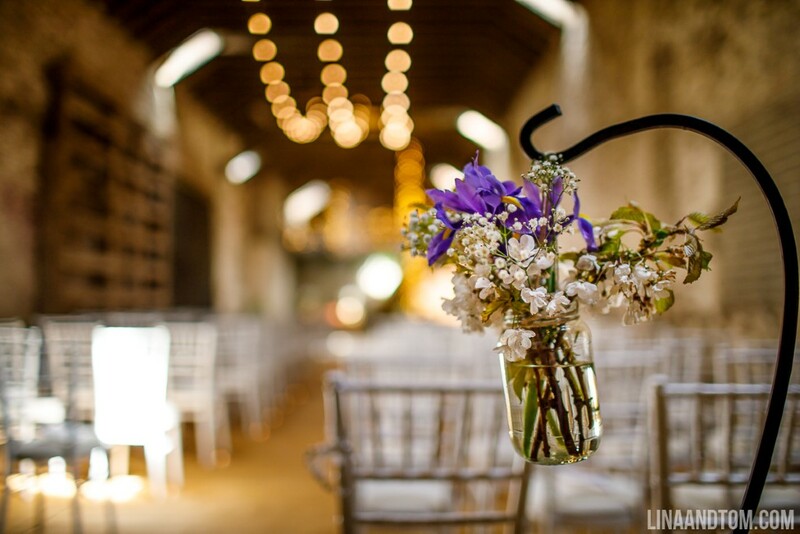 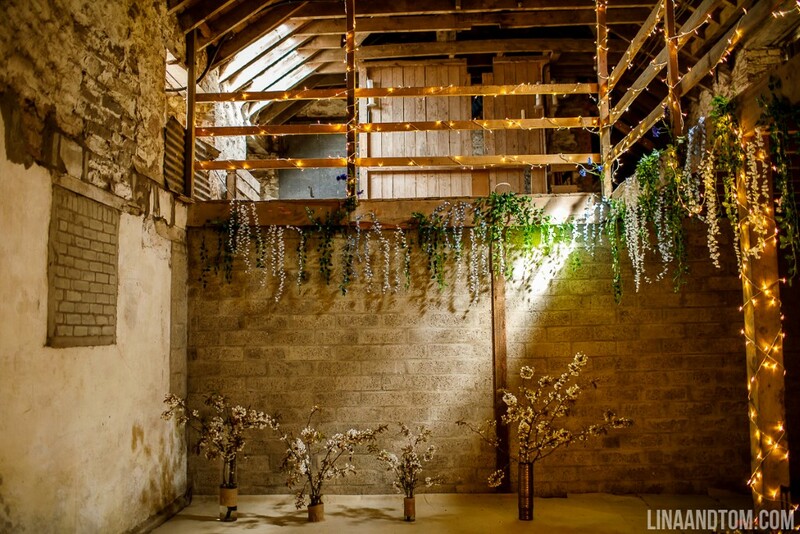 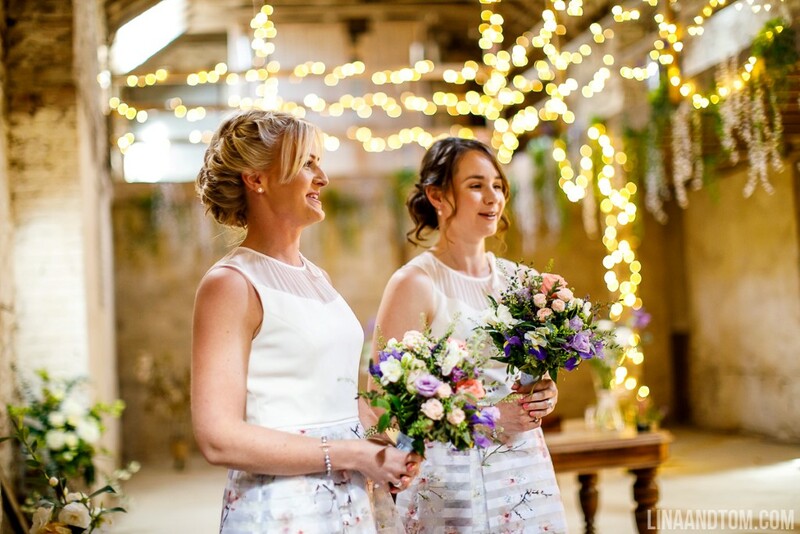 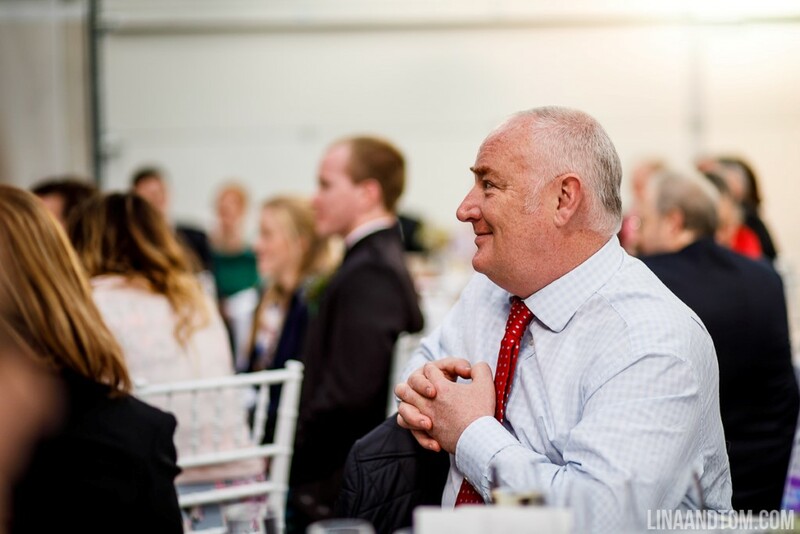 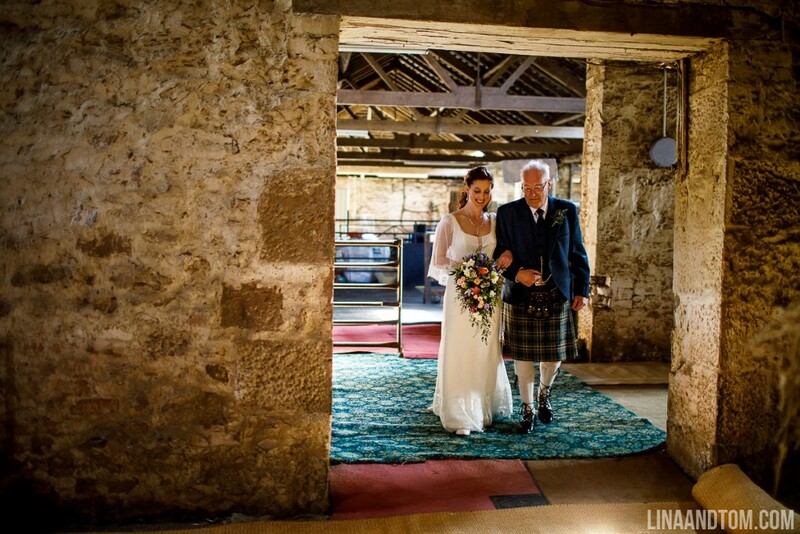 For me it felt incredible walking into the old barn, an already very special and sentimental place and seeing what we had created looking stunning and full of people and Ewen smiling at the end of the aisle. 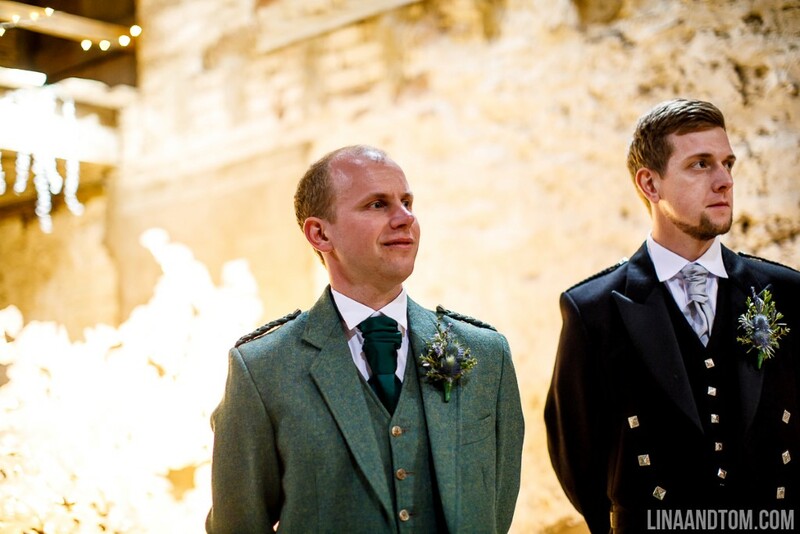 For Ewen seeing me for the first time coming down the aisle was perfect for him. 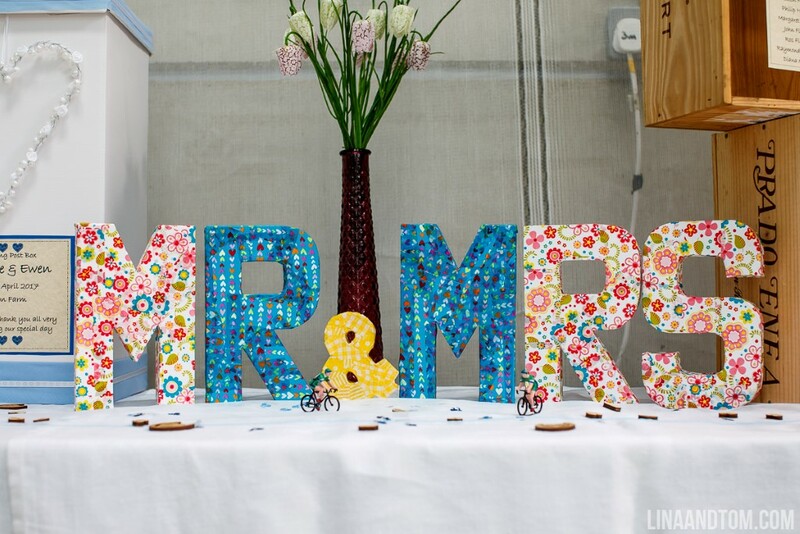 I would just say remember your day is about you as a couple, yes the details are lovely but try not to get too hung up on every tiny thing. 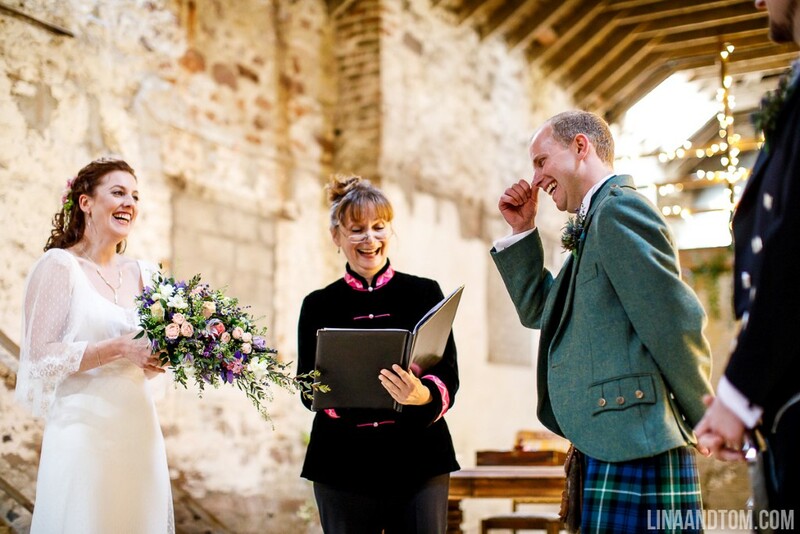 We had to be decisive and a little ruthless as we had such a short timescale, but actually we couldn’t have planned it better if we ‘d had years. 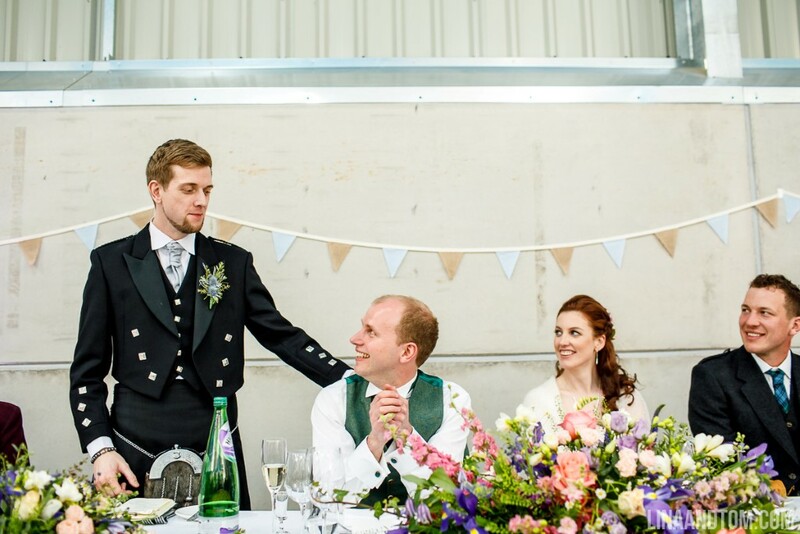 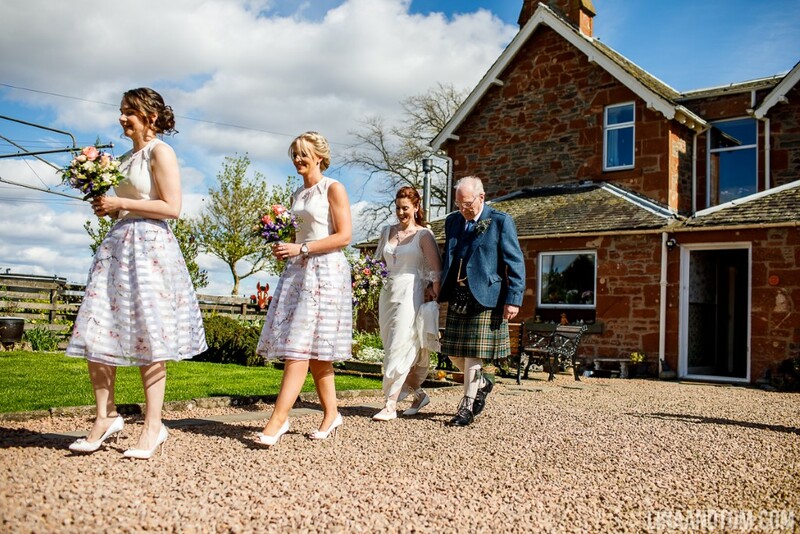 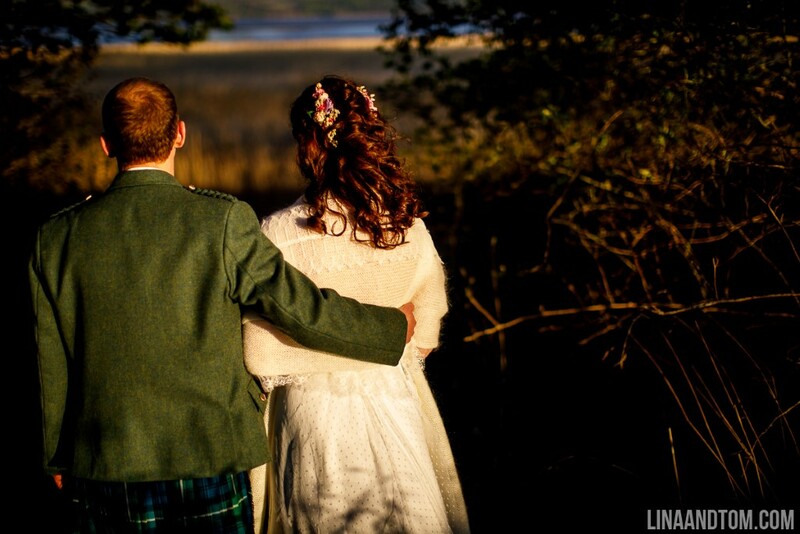 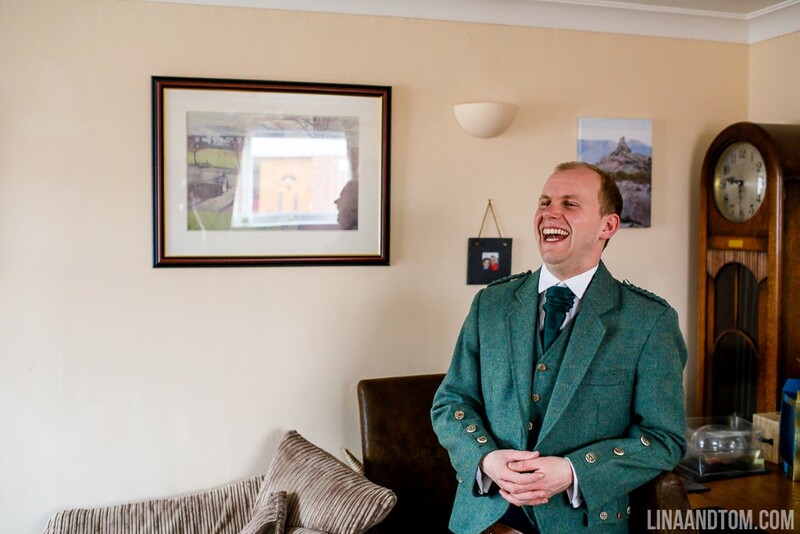 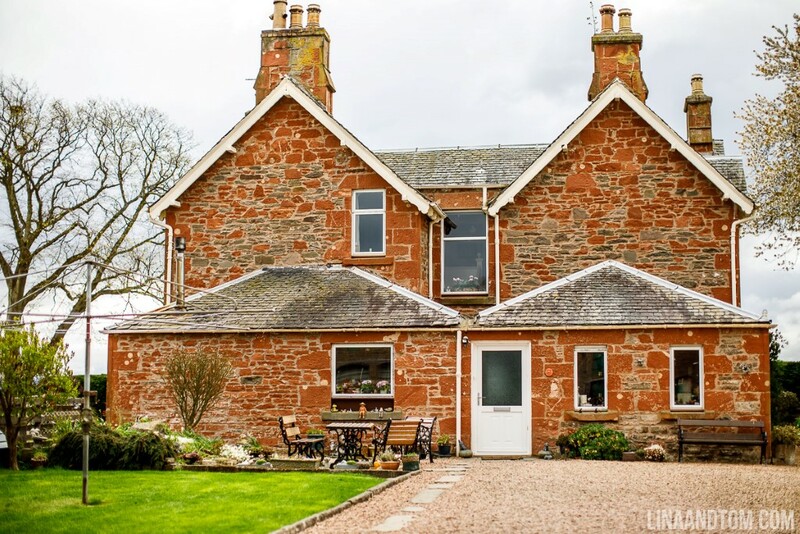 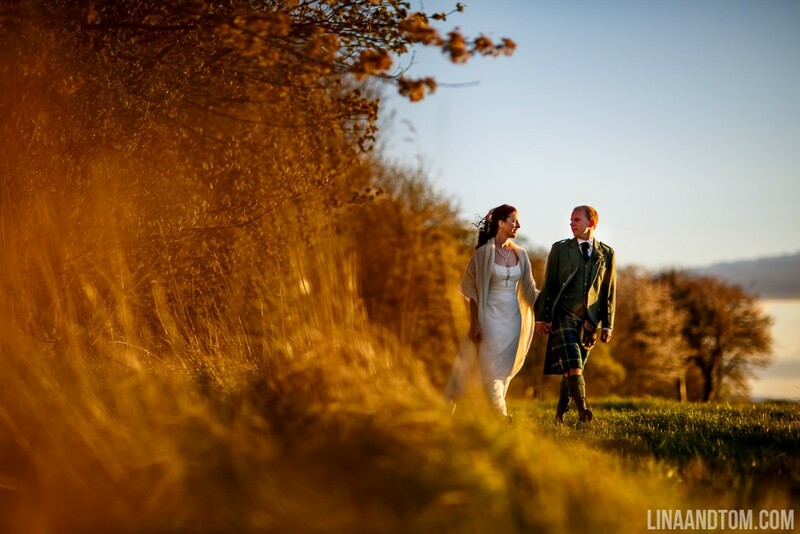 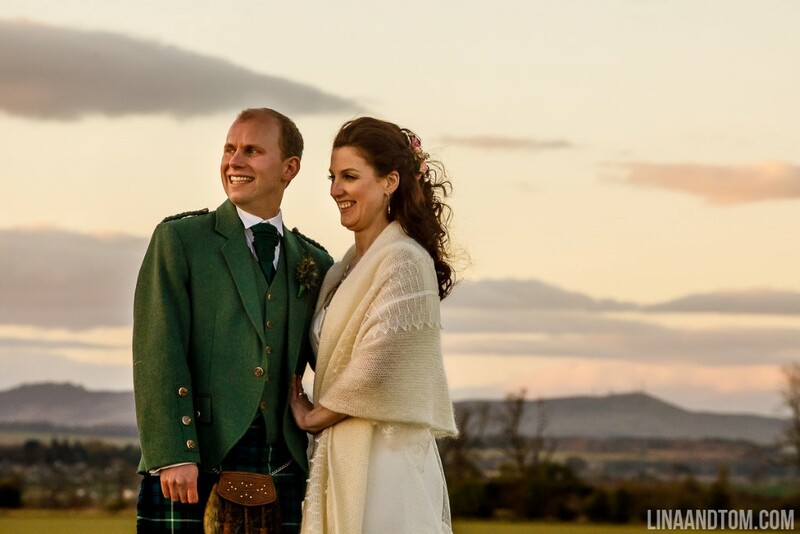 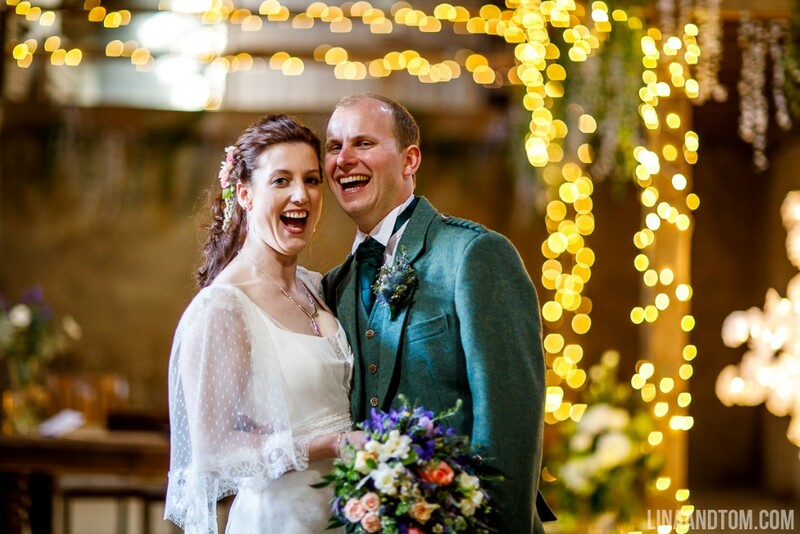 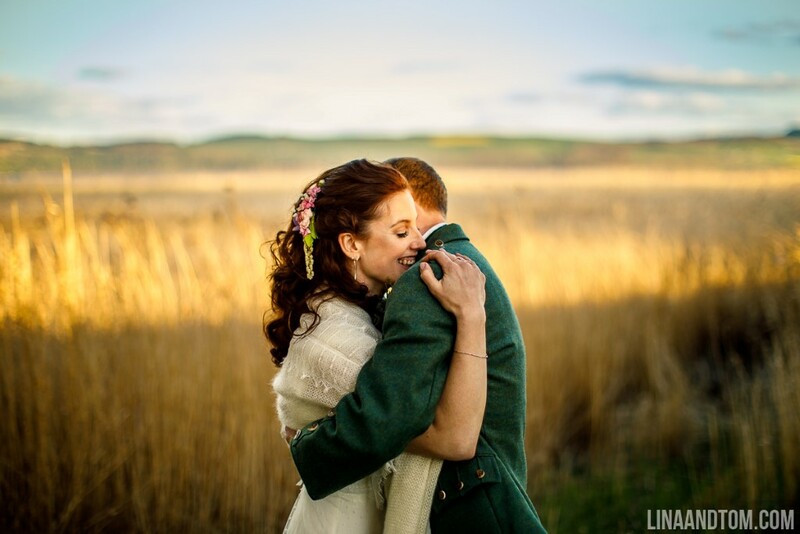 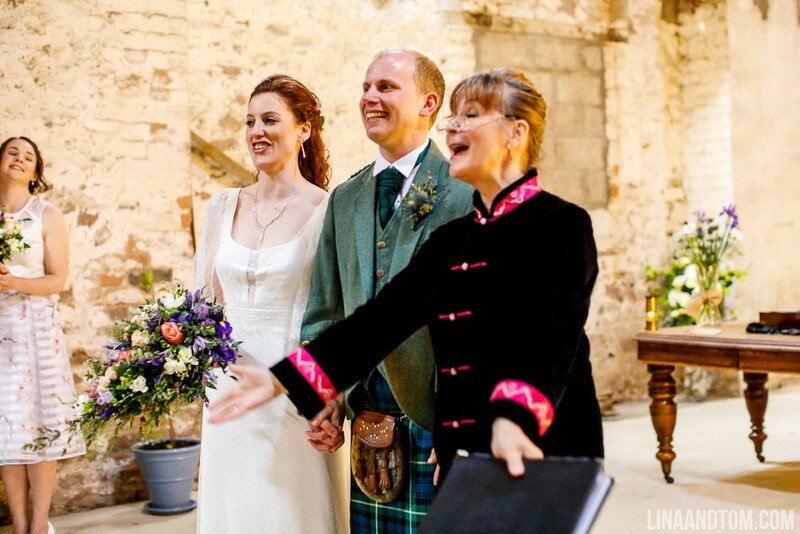 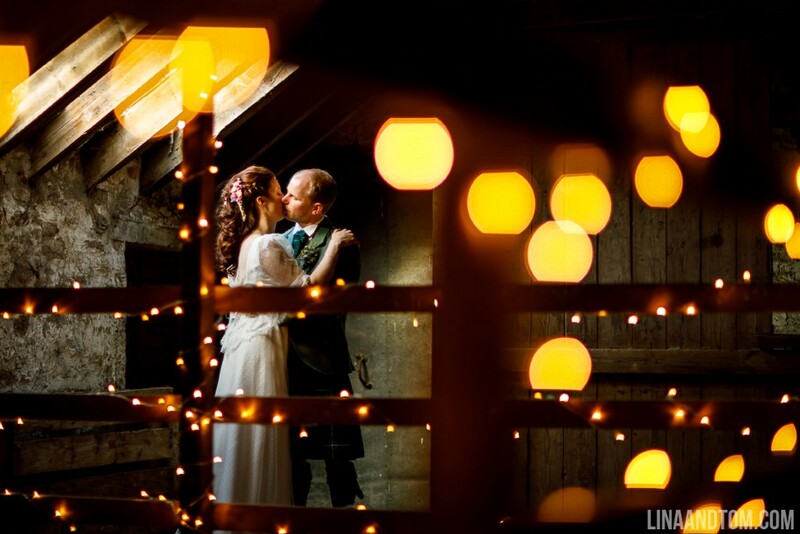 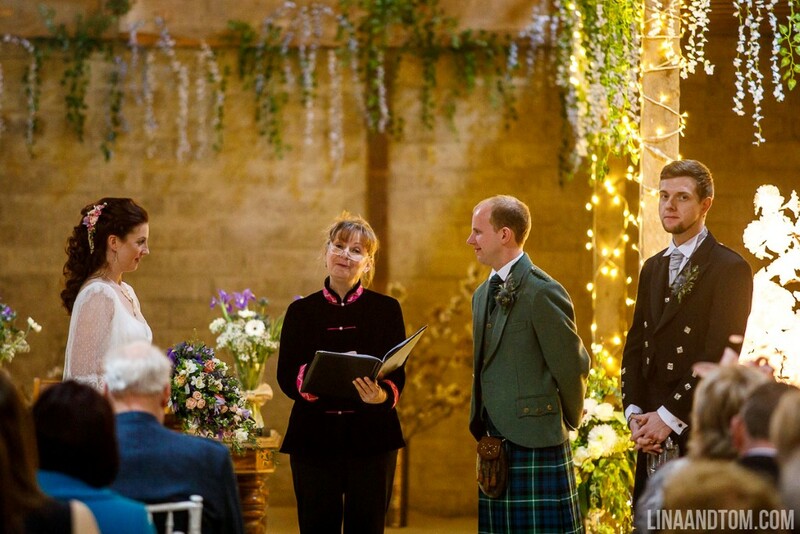 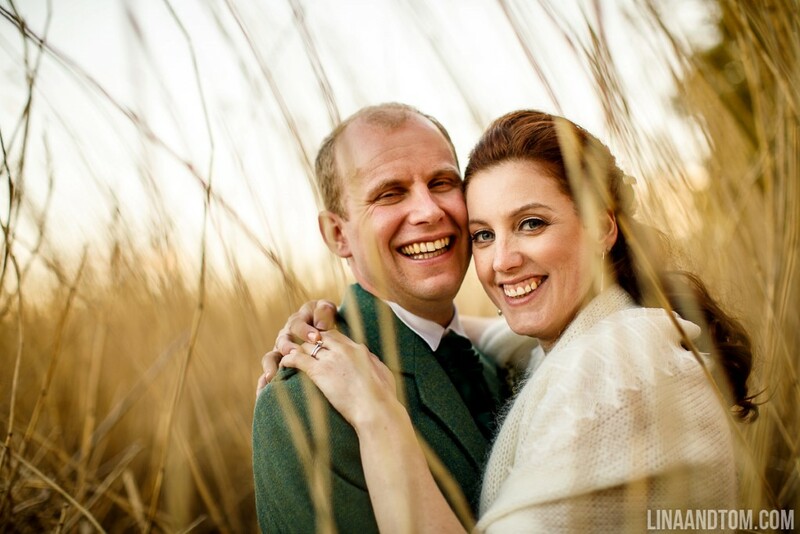 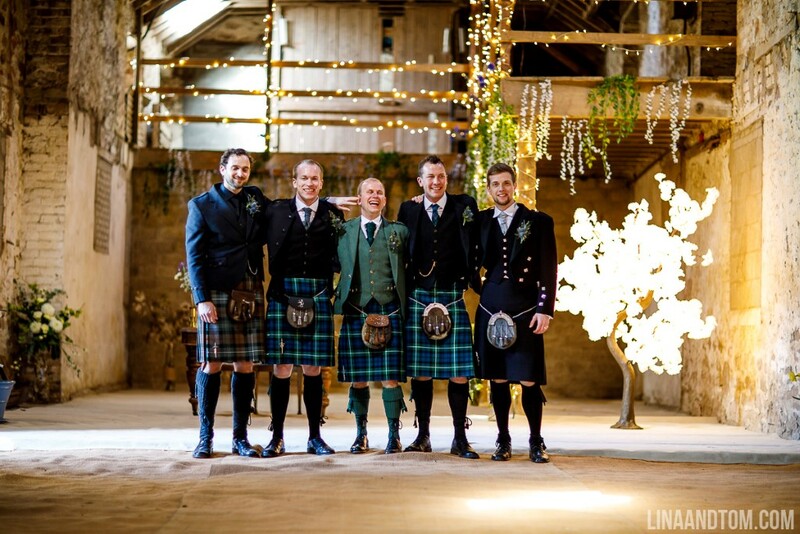 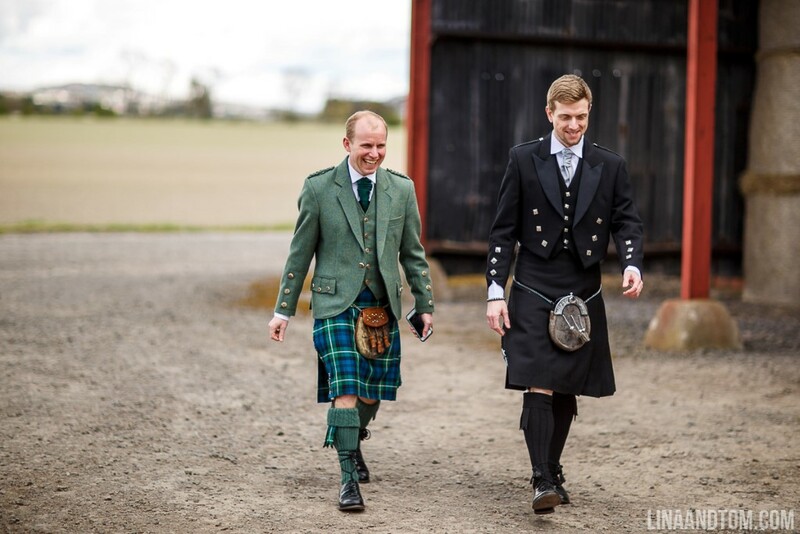 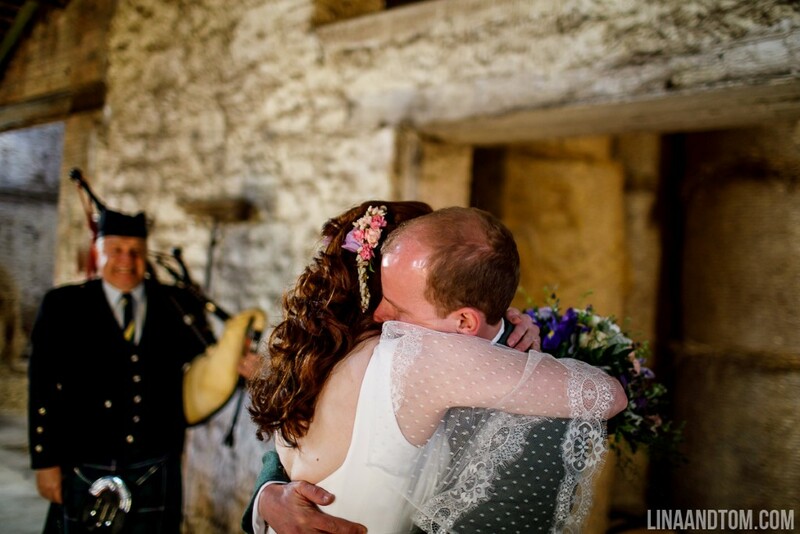 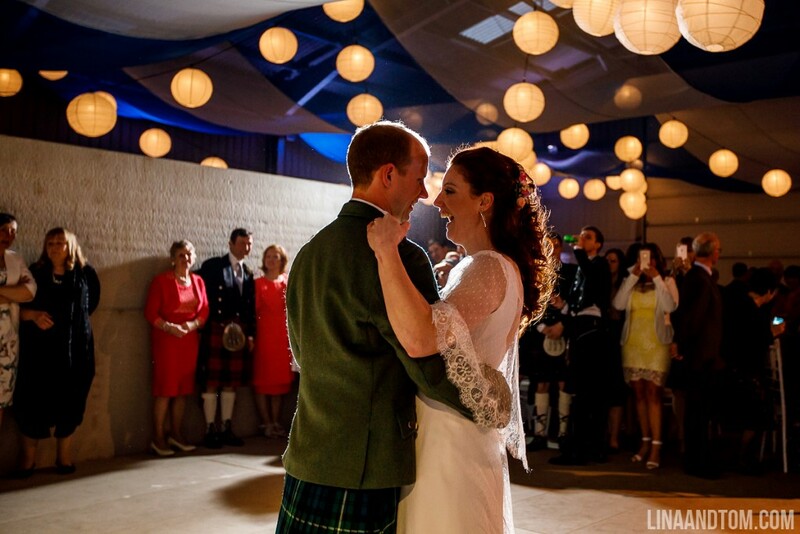 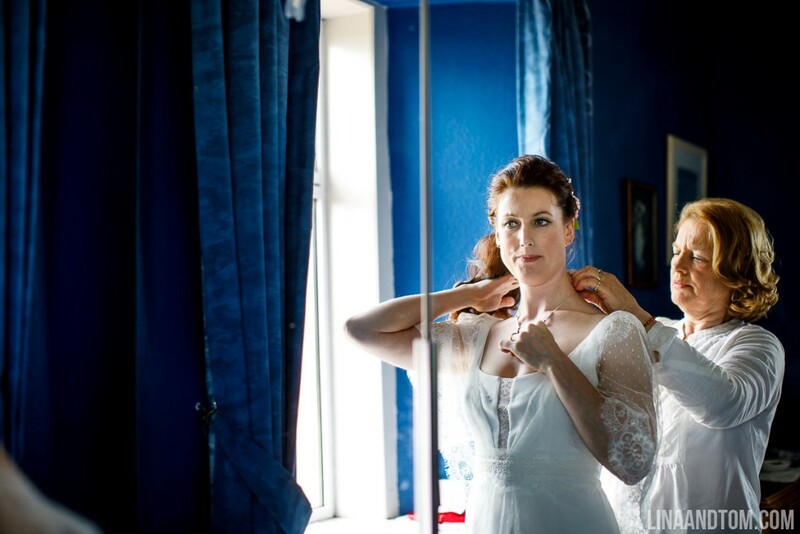 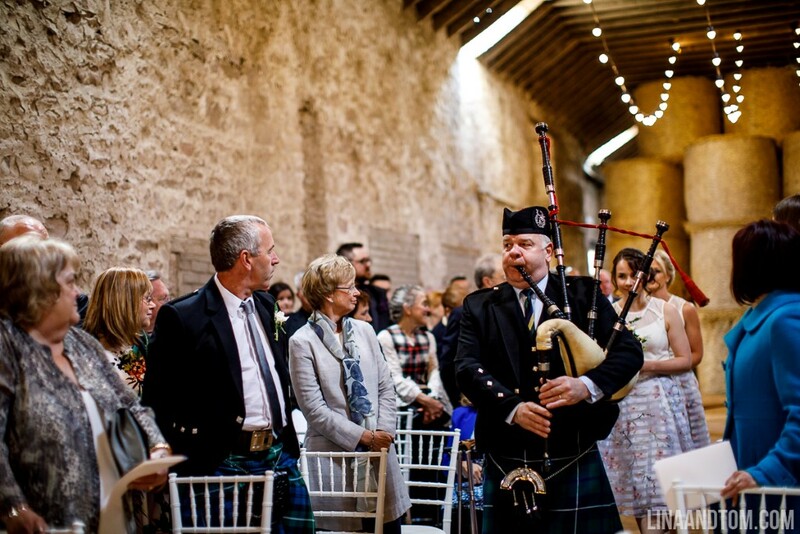 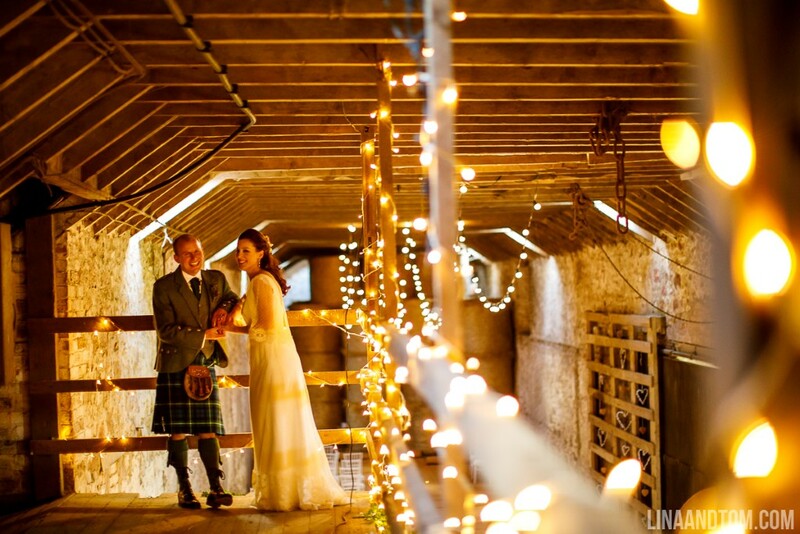 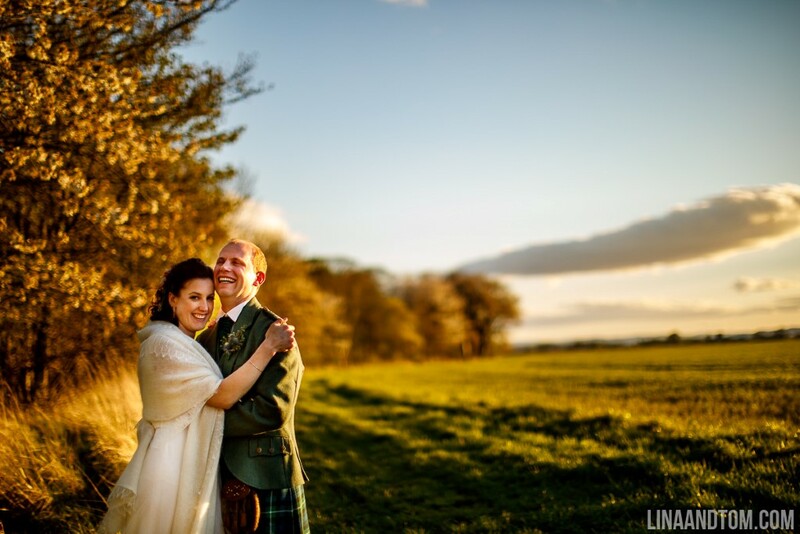 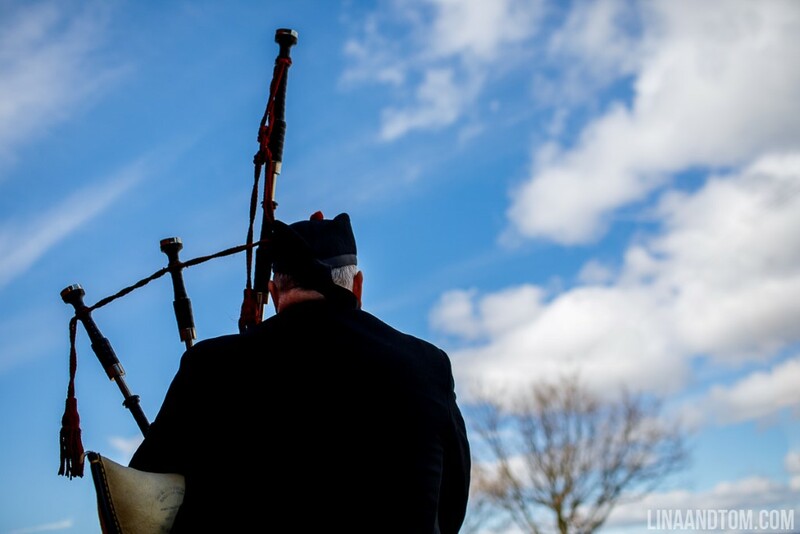 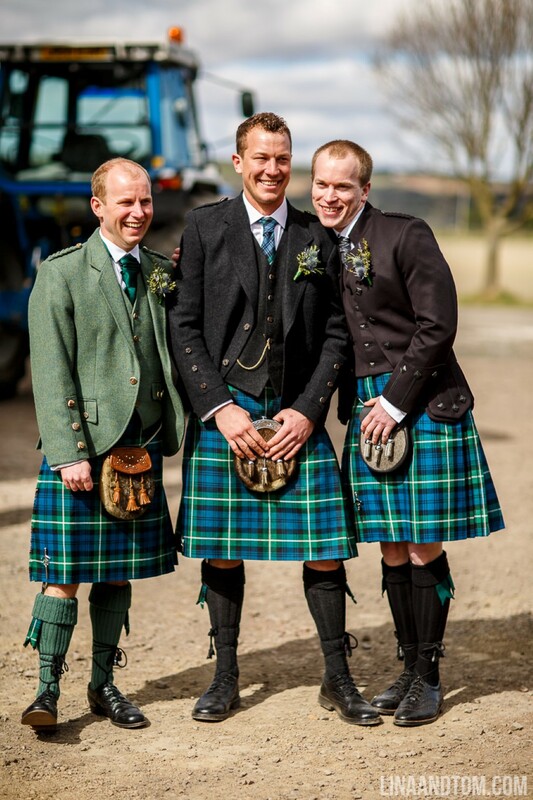 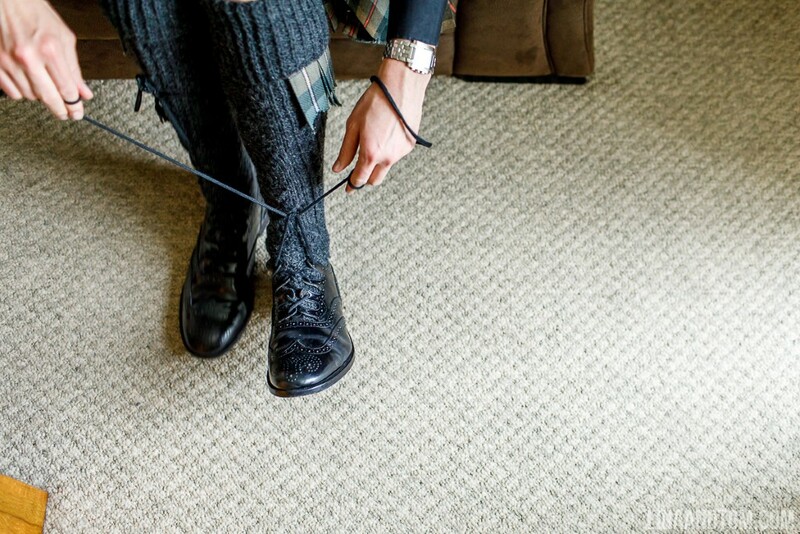 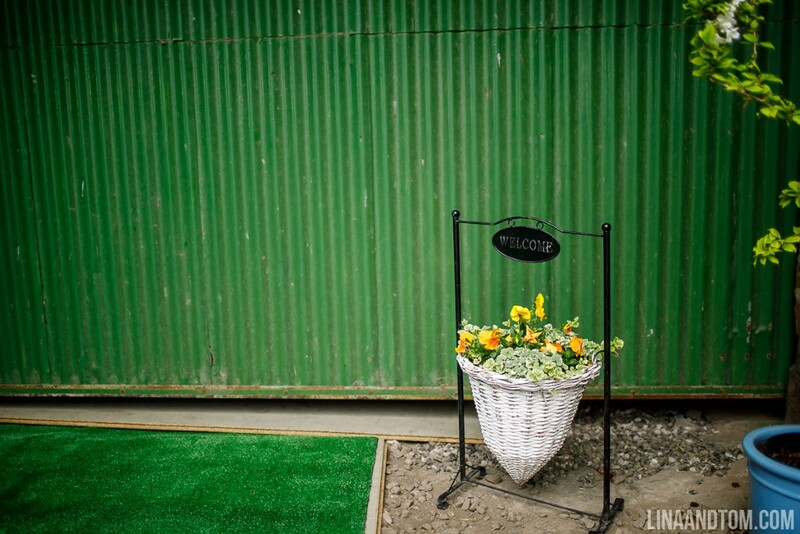 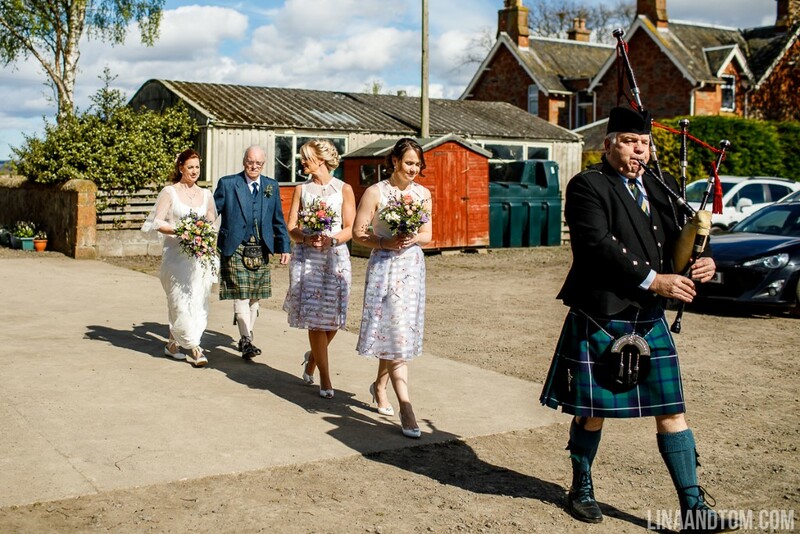 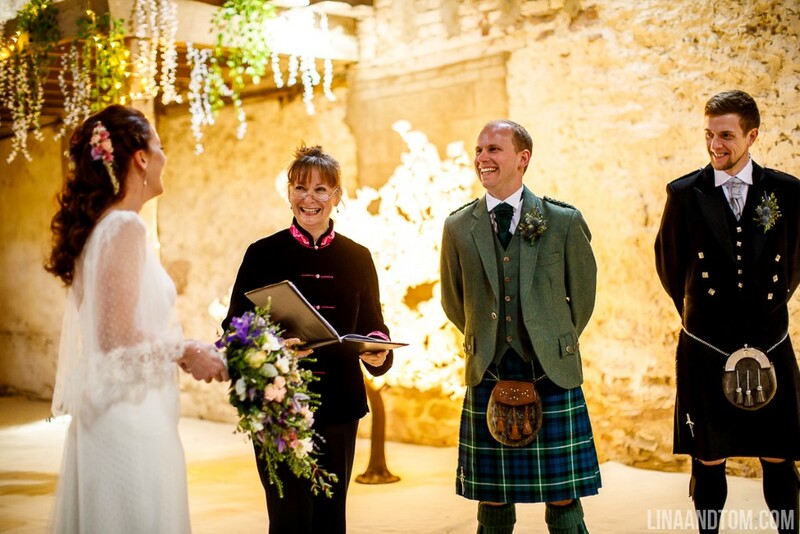 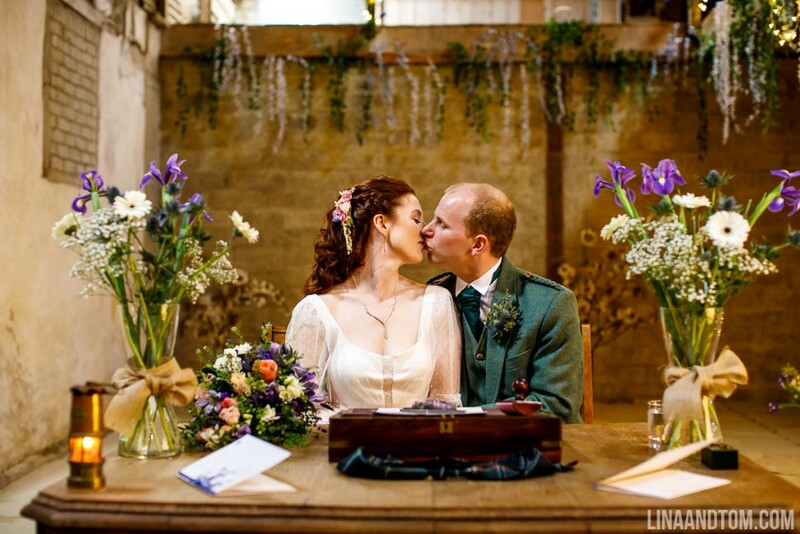 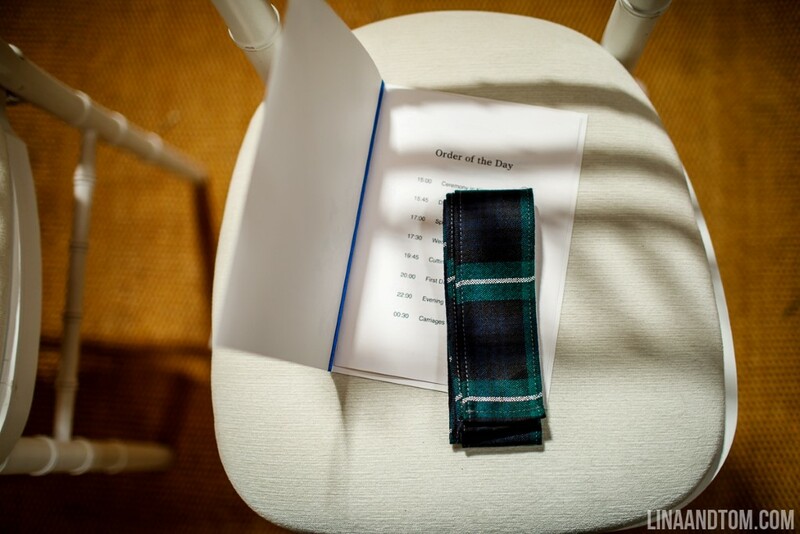 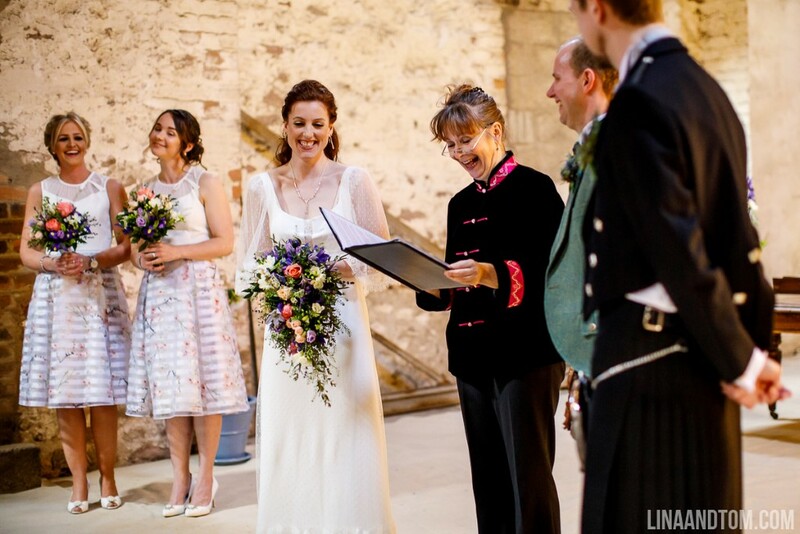 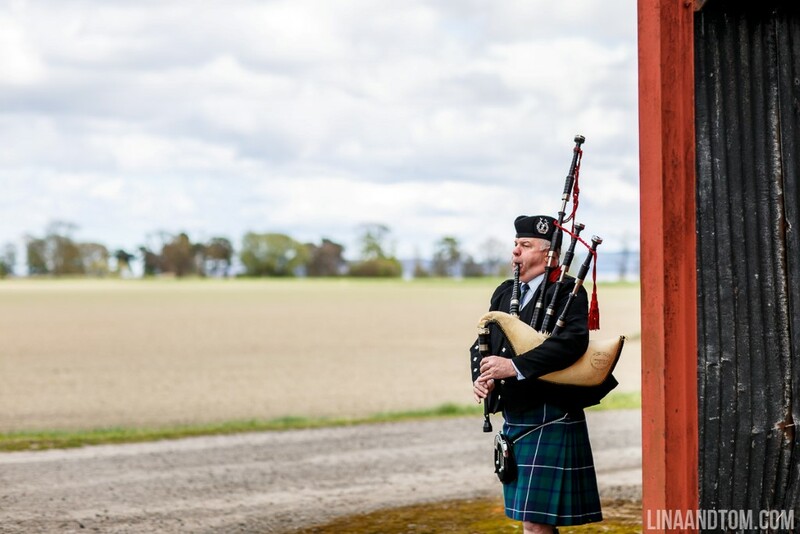 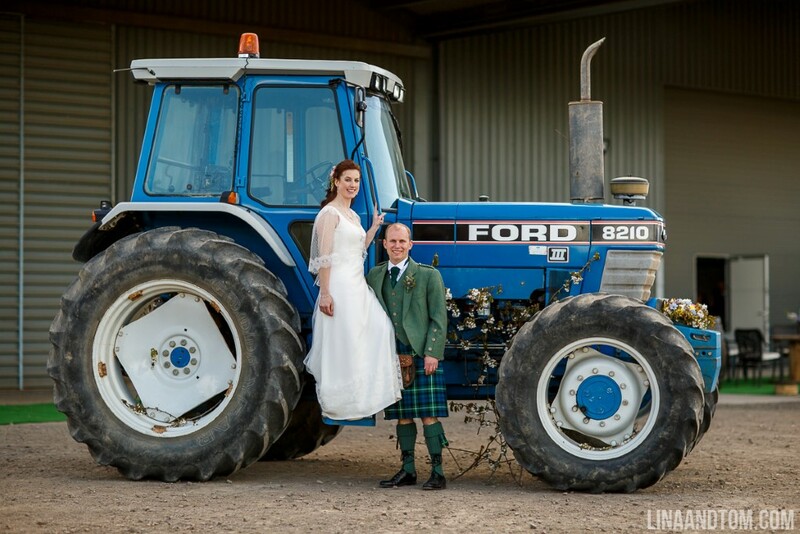 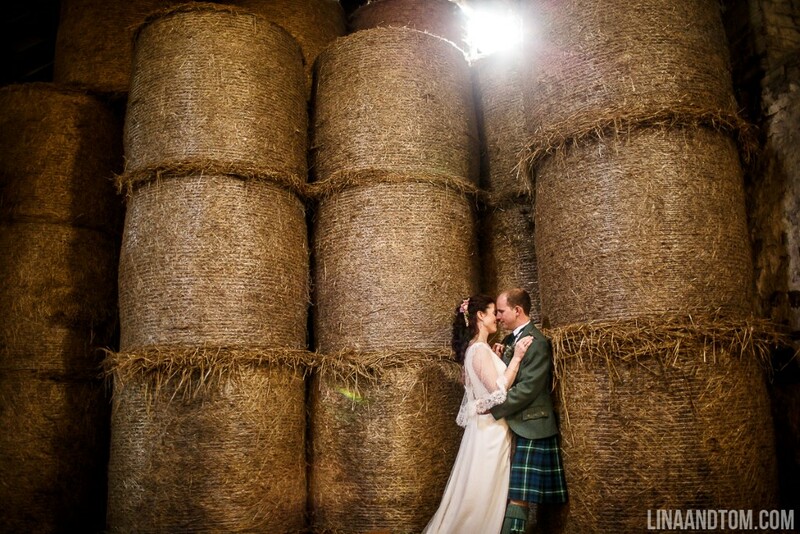 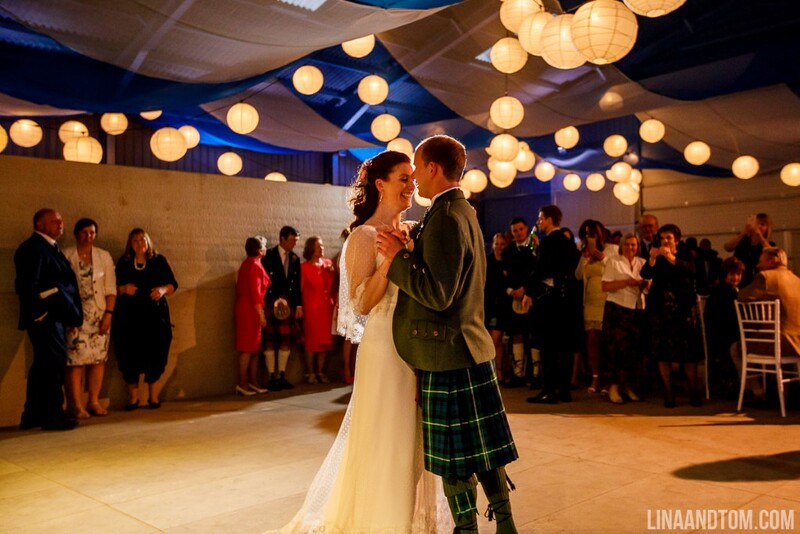 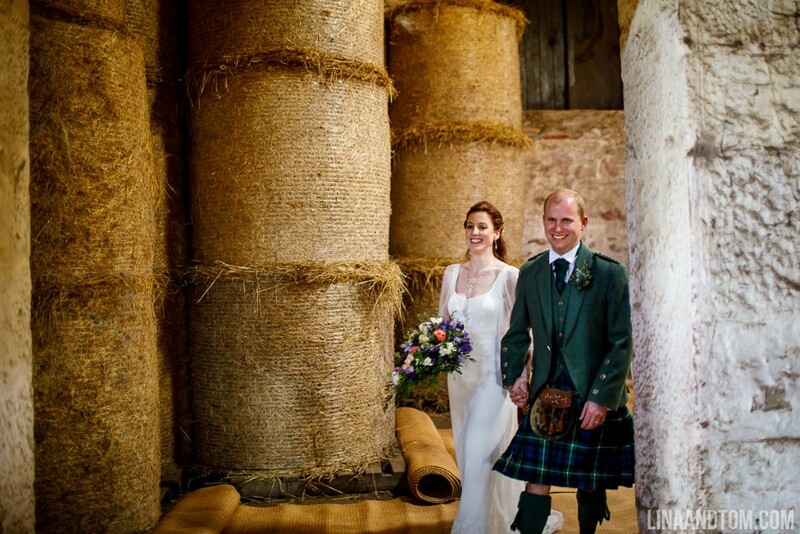 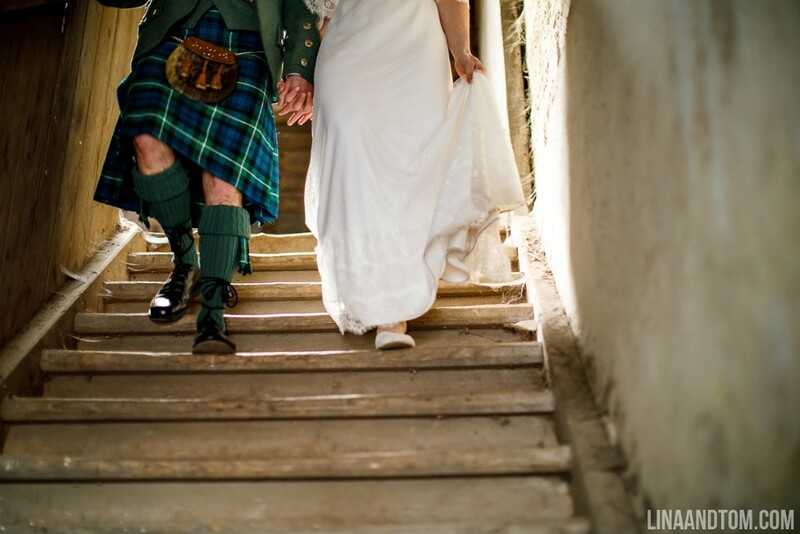 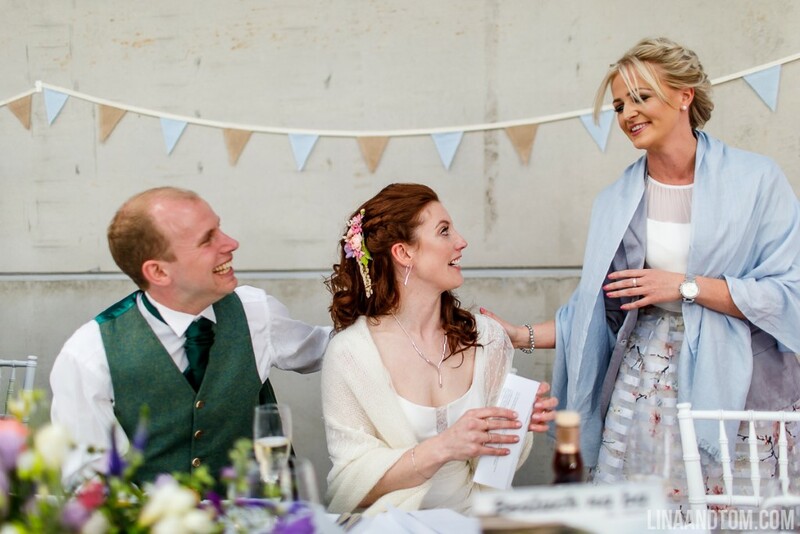 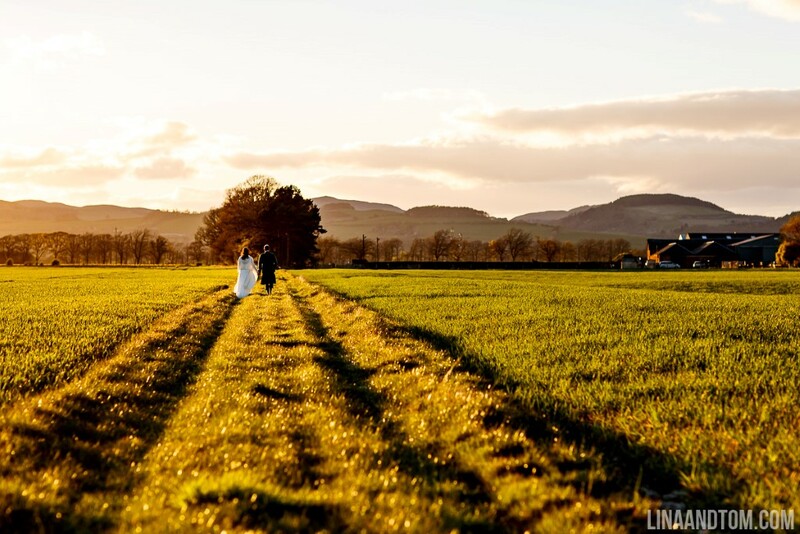 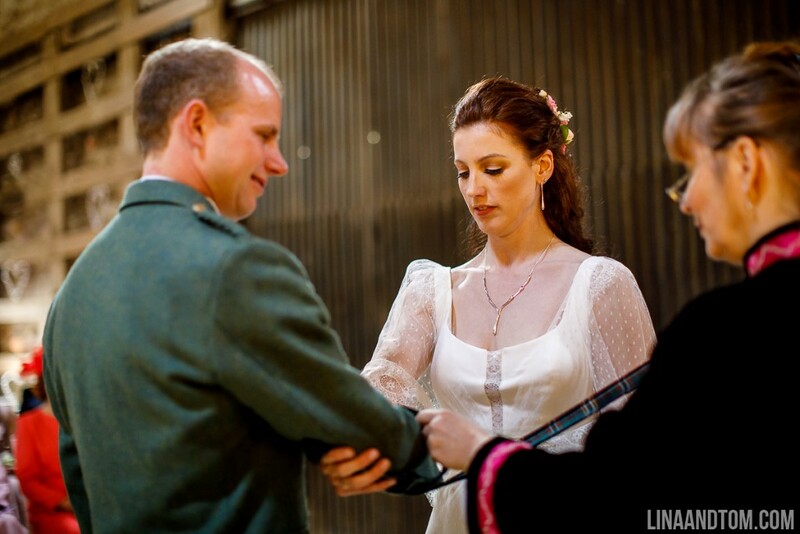 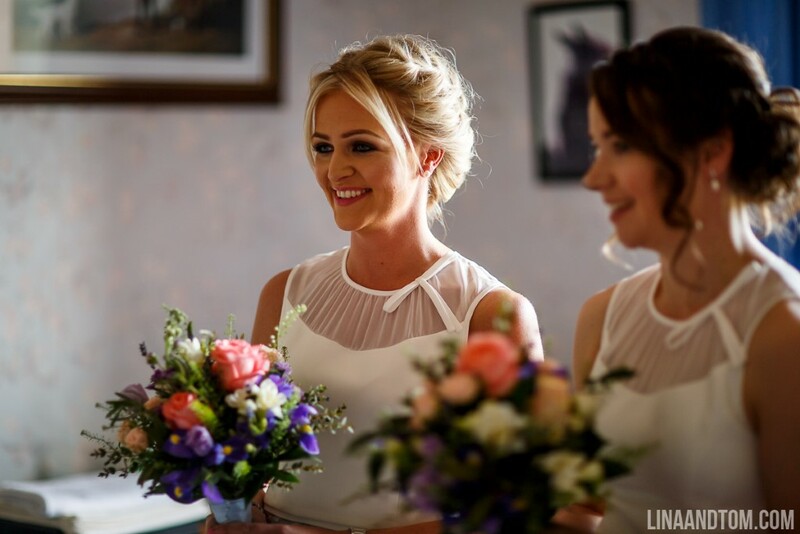 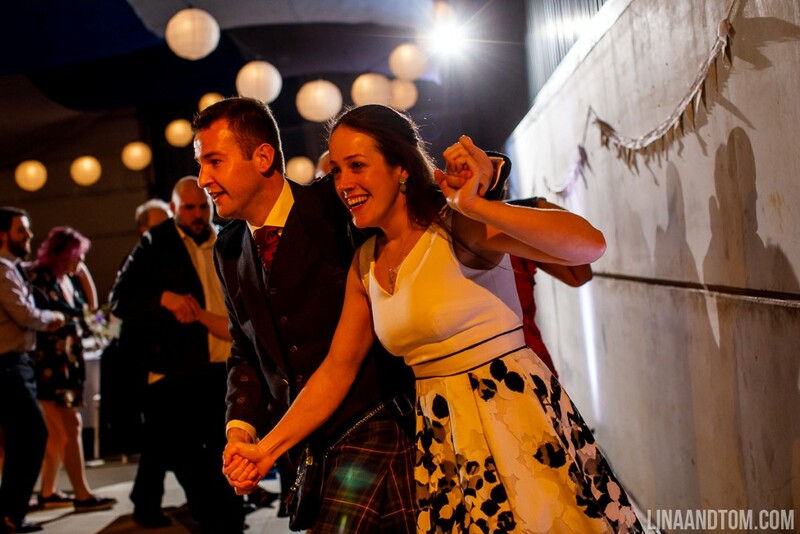 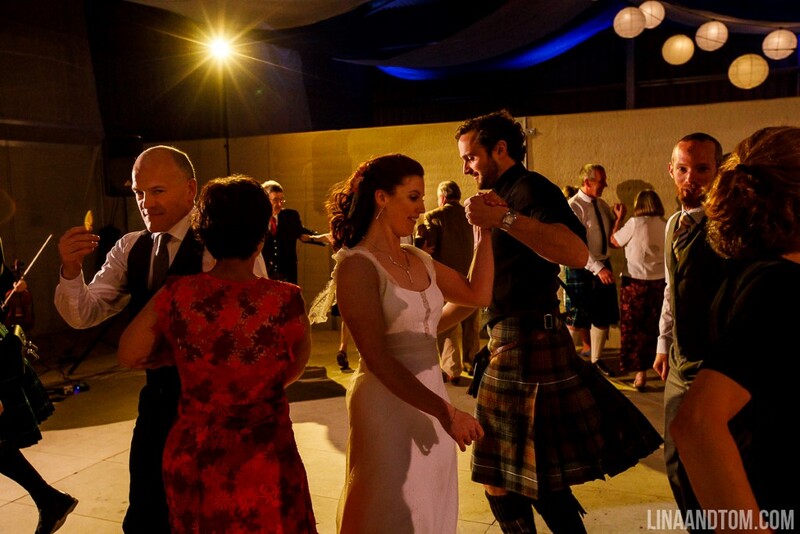 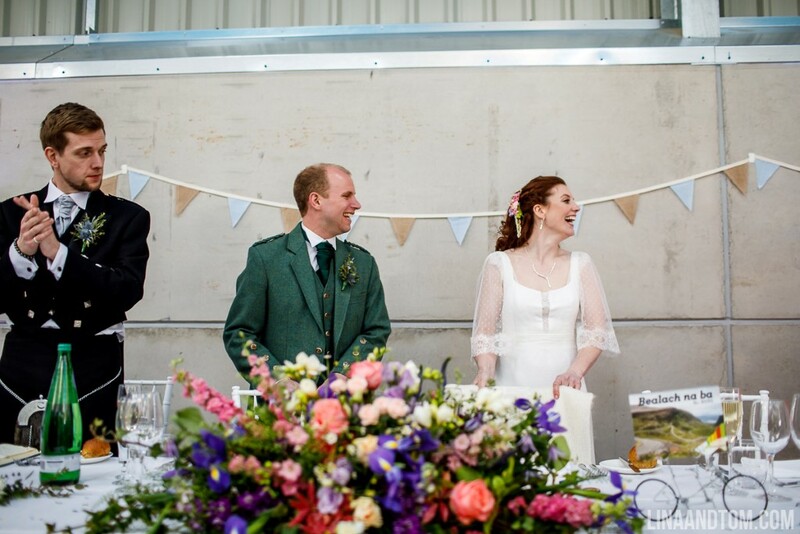 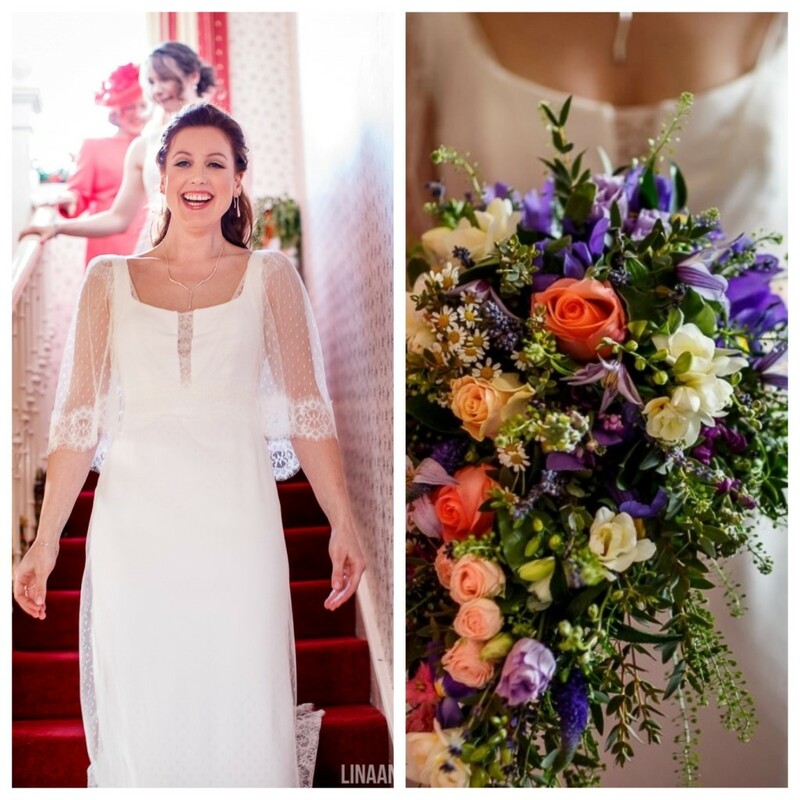 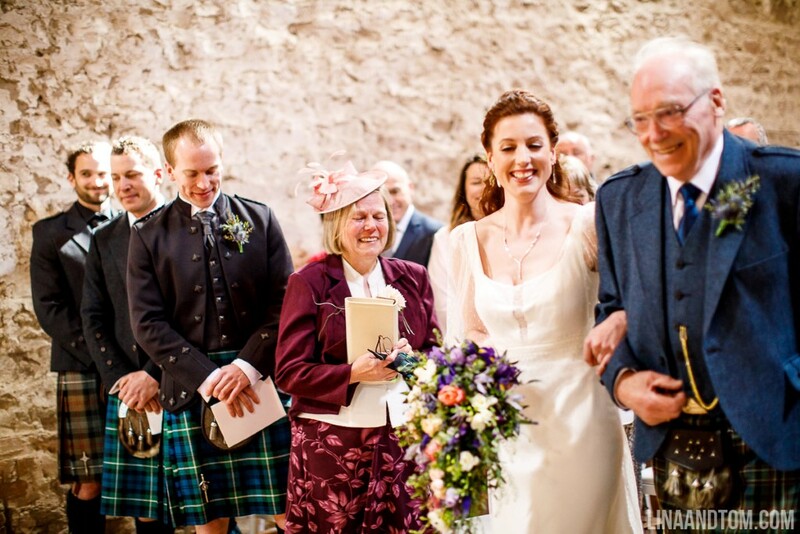 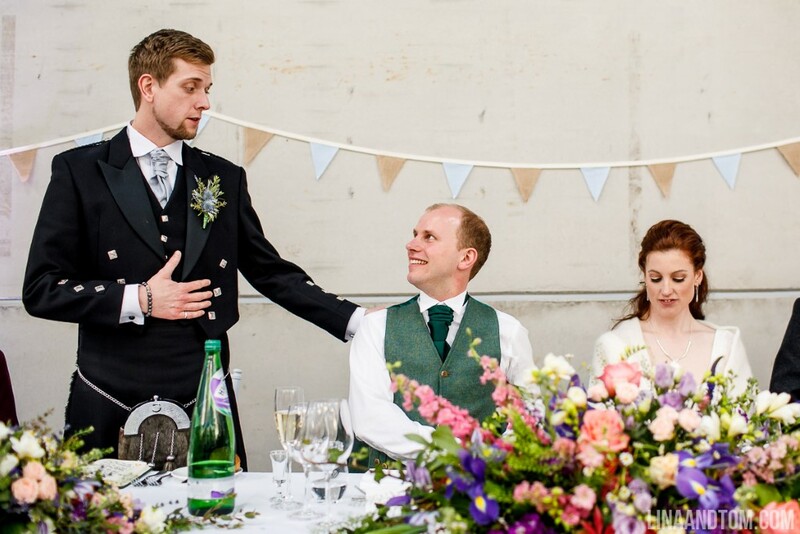 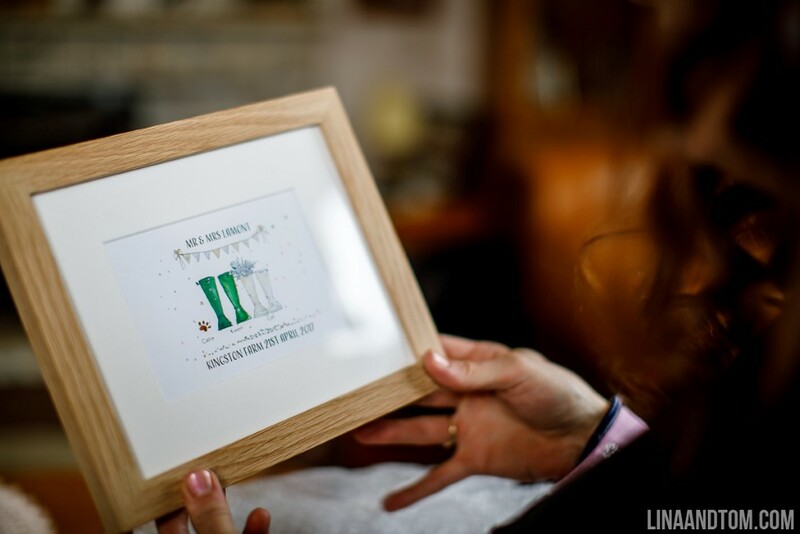 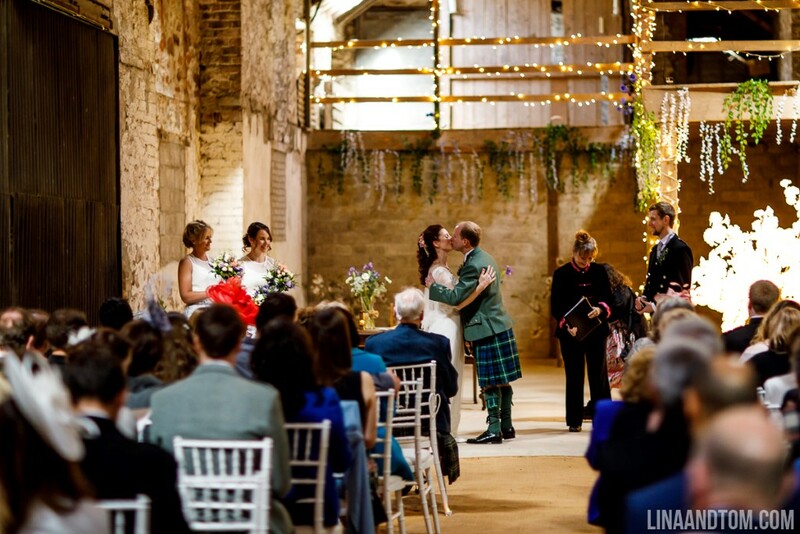 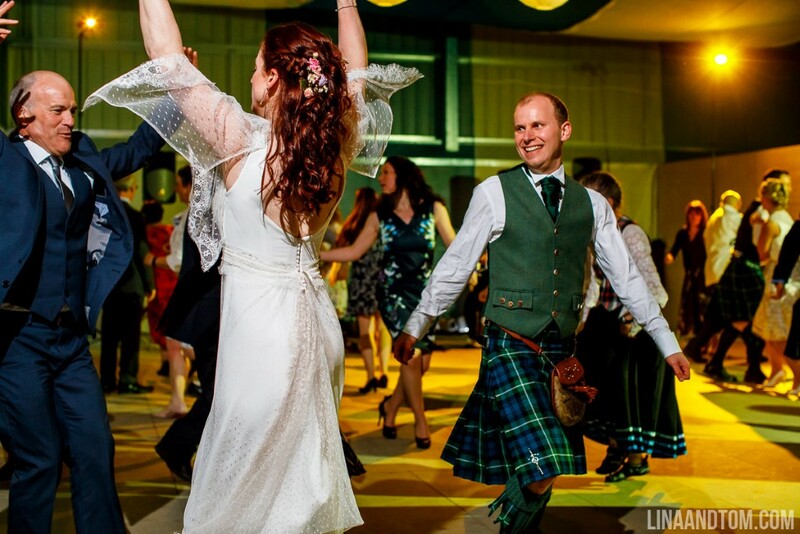 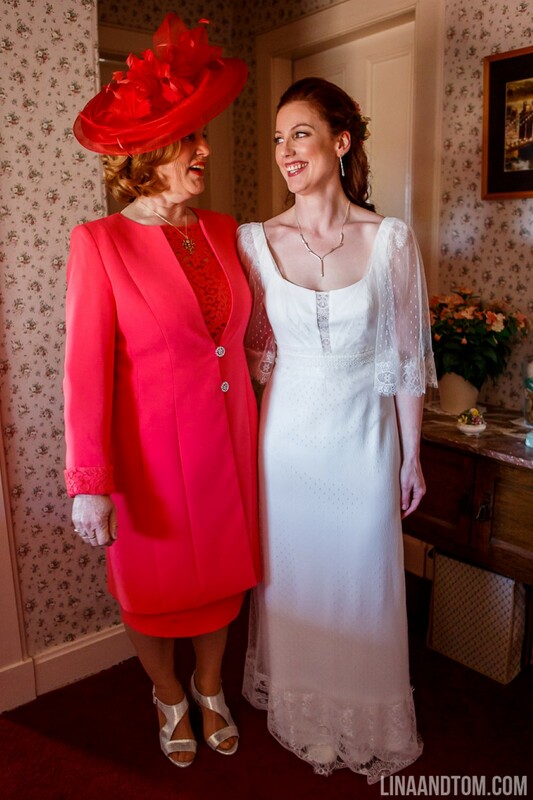 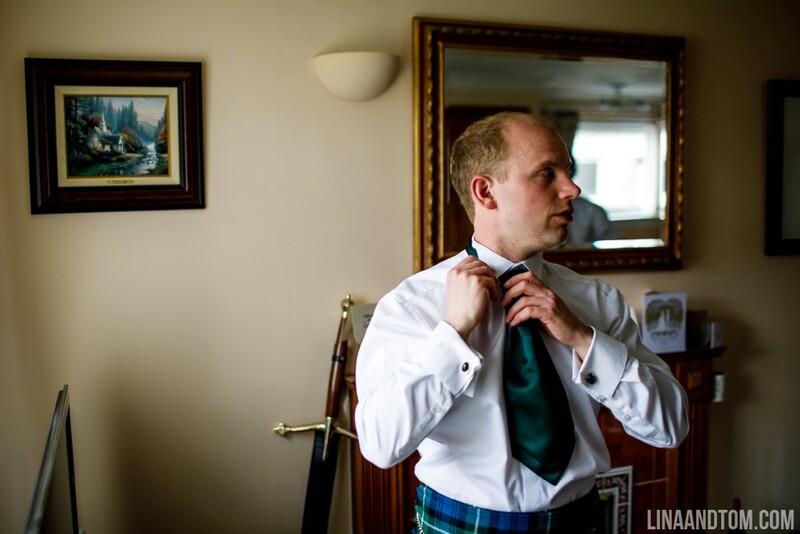 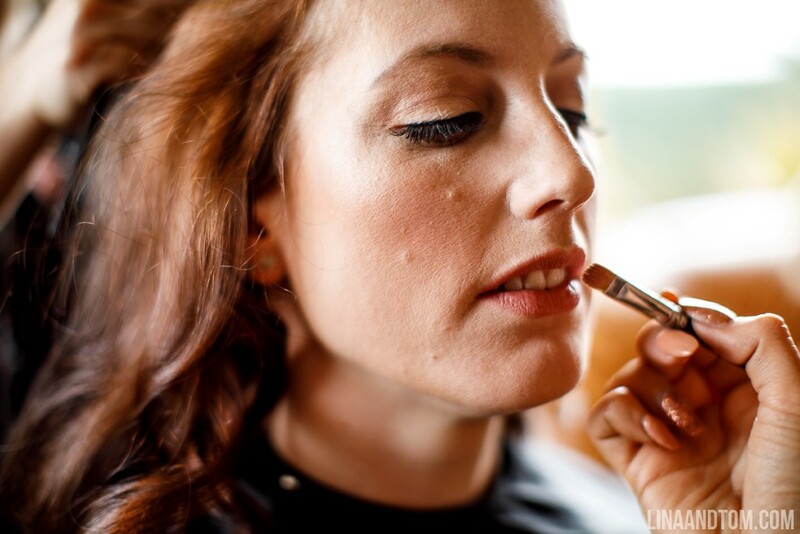 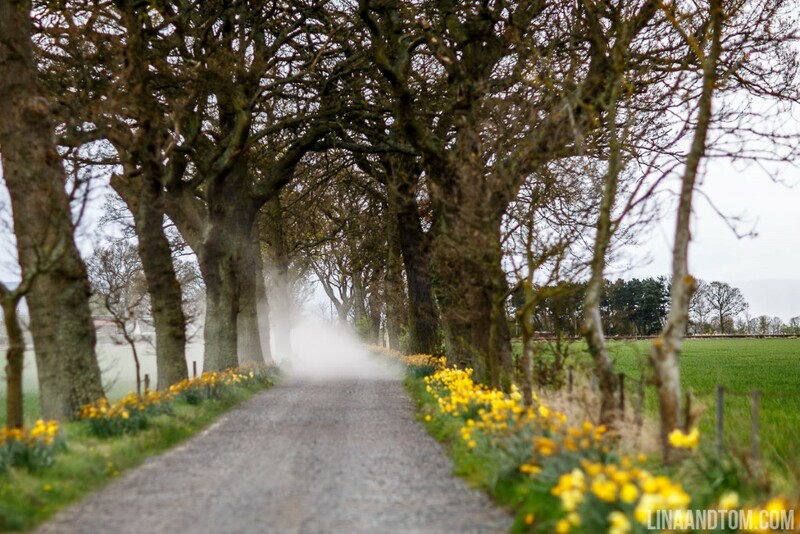 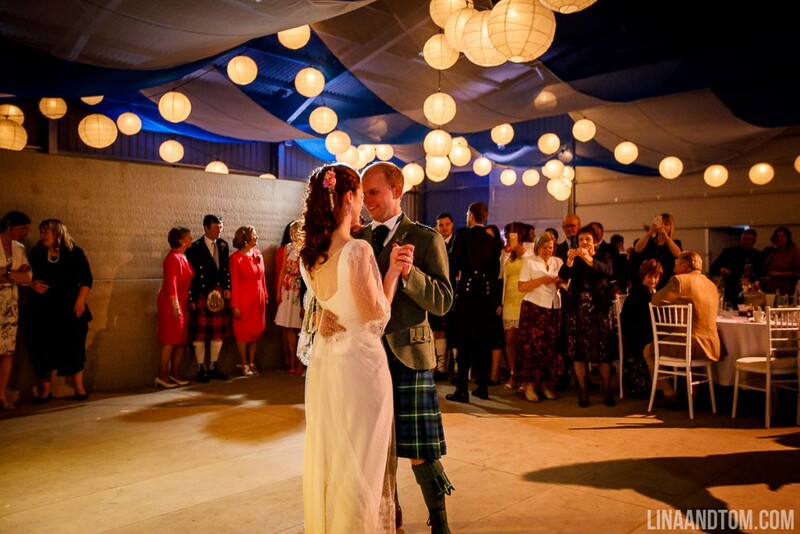 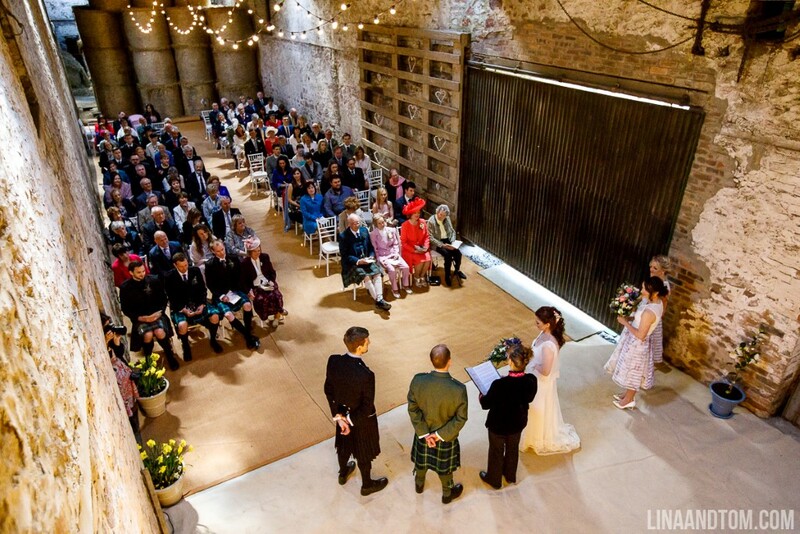 Thank you so much to Lina and Tom for sharing this stunning Scottish farm wedding. 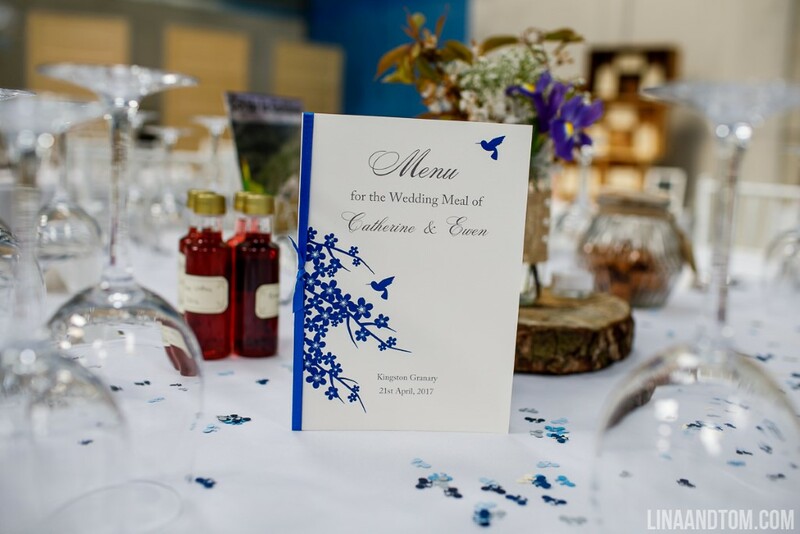 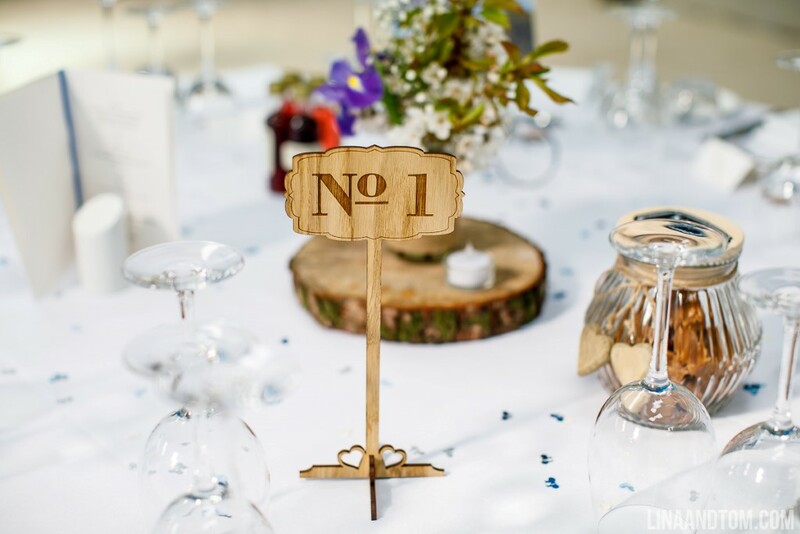 The bold blue and purple colour palette contrasts beautifully with the country surroundings and the beautiful touches from the DIY wine pallet table plan to the homemade wine and gin and all the freshly cut blossom, add up to make this a very special and personal celebration.